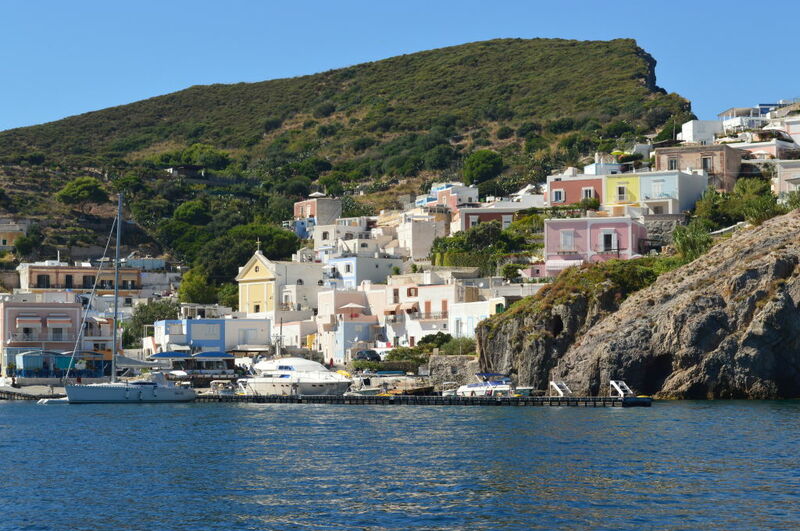 When the ferry boat reached the harbour of Ponza, we had the feeling of being embraced by the town itself, which with its curved shape is welcoming and inviting you to get off and enjoy all the beauty of the place: the multicoloured houses sloping down are lovely and they immediately give you the feeling that you are going to spend exciting days on the island. As soon as you get off the ferry boat, you have a wide range of choices to move around the island: you can rent a scooter, a quad, a boat, or you can decide to go by mini-taxi or bus. Unless you have a scheduled plan, maybe the best solution is to reach your hotel/apartment, do a short tour around the area and understand the most convenient means of transport for you. 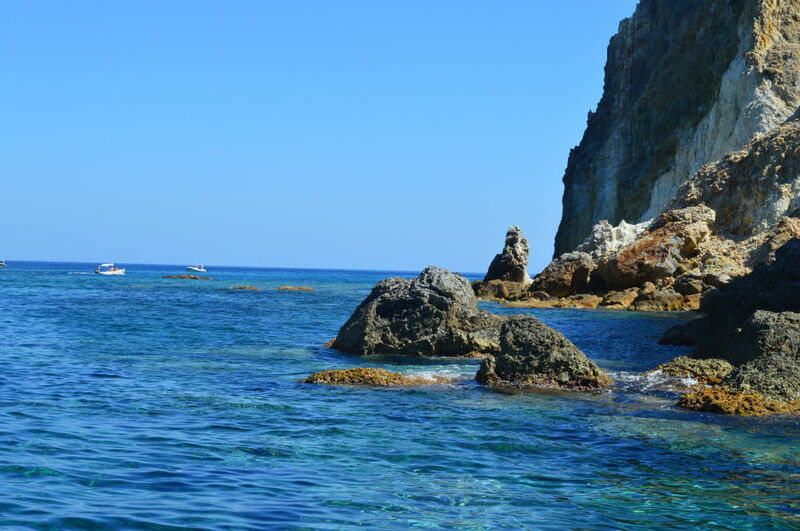 In the end of this article, you’ll find all our suggestions to reach the island and move around it; now we prefer to astonish you with the description of this charming place! 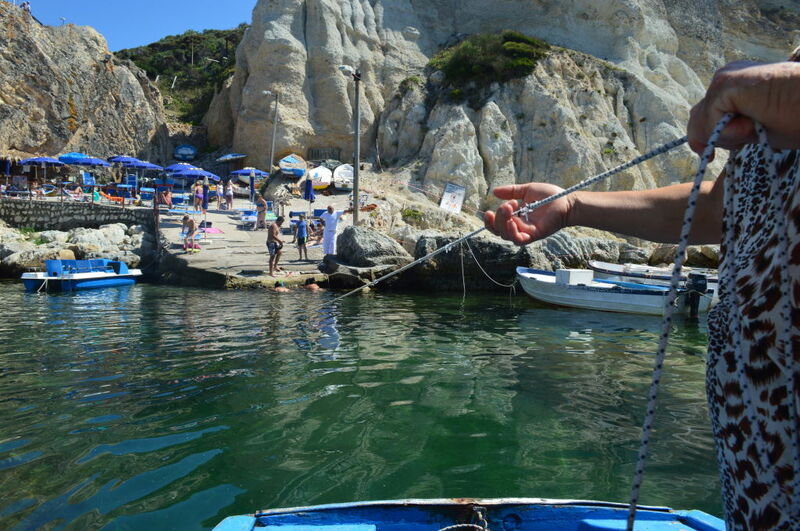 Basically, you can visit the island of Ponza in 2 ways: by land and by sea. Useless to say, by sea is the most interesting and appealing way! 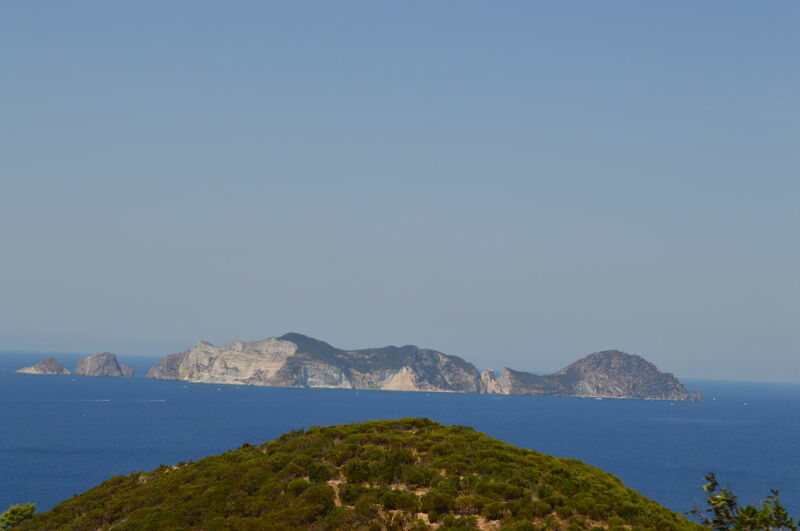 If you decide to go by land, you have to know that, being a vulcanic island, still wild someways, you have to walk quite a lot to reach the bays and beaches where you can swim and have a sunbath. 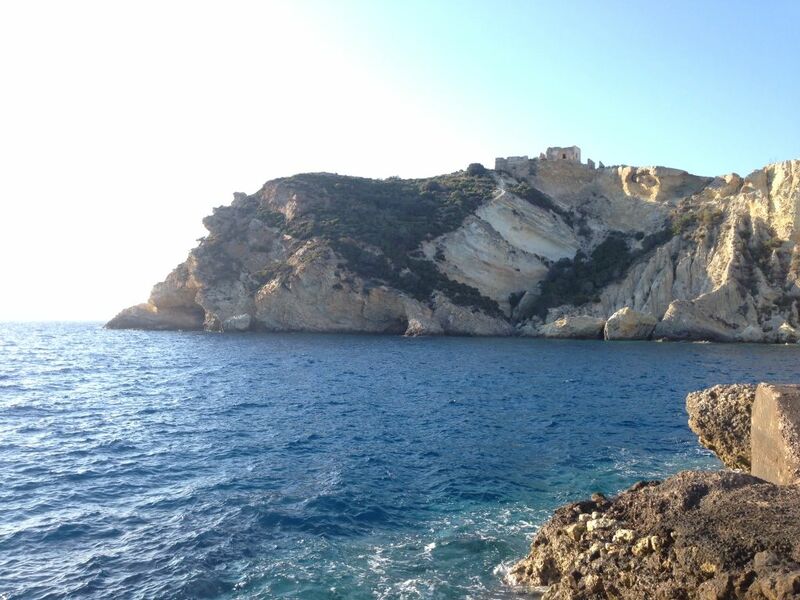 For example, to reach Cala Gaetano, you have to walk about 300 steps!!! 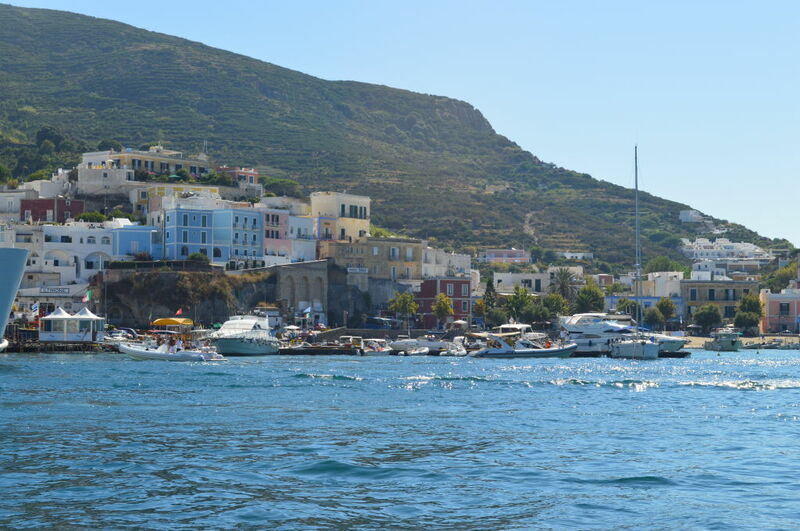 If you don’t feel ready enough for this, rent a boat or have a boat tour with one of the agencies you can easily find around the harbour area. Moreover, consider a few things: if you go by boat you can see the island from a unique perspective and you can also reach some bays that you can’t reach by land. 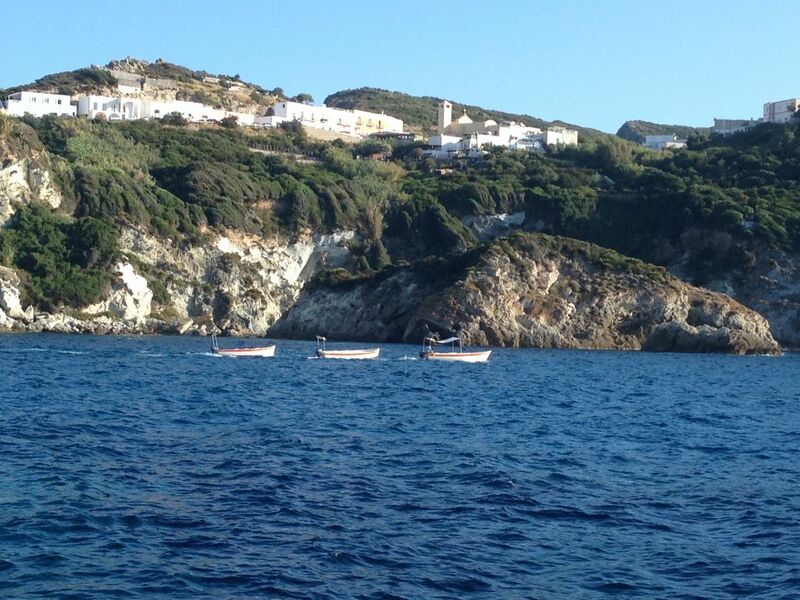 Not going by boat, not even for one day, means missing the most exciting and attractive part of the island. 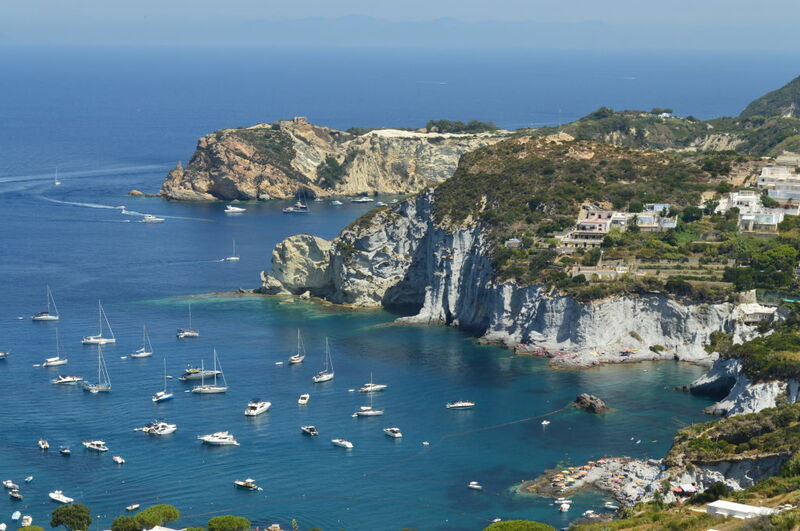 Ponza is an incredible concentration of things to see and do in just 7 kms of coast: the island’s periplus begins from the harbour, an old complex built during the Bourbon’s colonization, whose structure makes it one of the most beautiful landing in the Mediterrean sea. 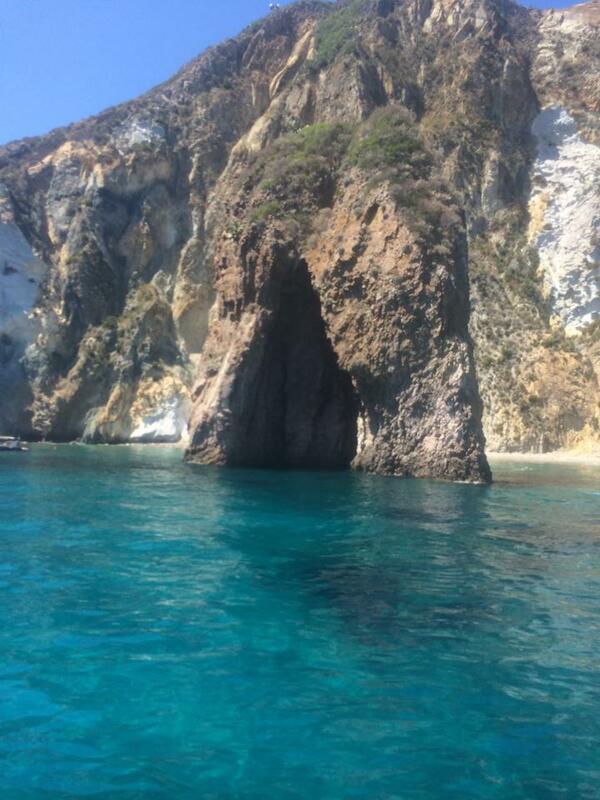 Sailing south, you immediately come across the Pilate’s Grottoes, so called because Pilate was sent to the island to personally quell a revolt. 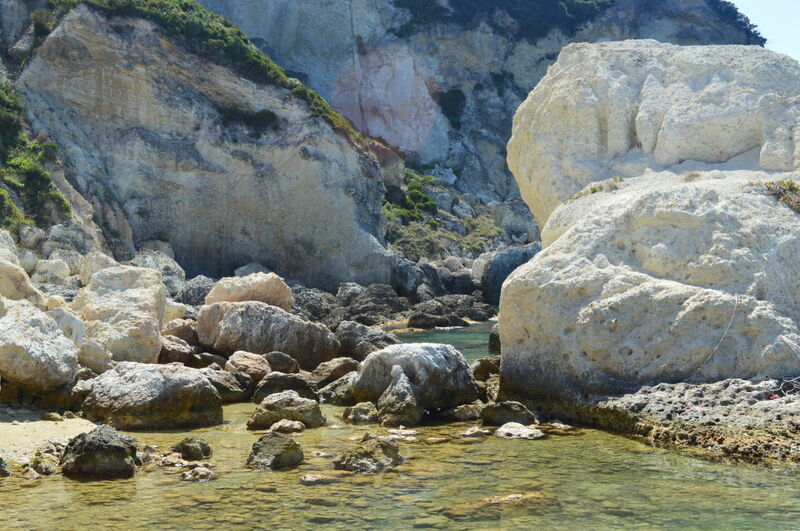 The Grottoes are an incredible example of hydraulic architecture during the Roman times, about 2000 years ago, when they hollowed the pools (and the connecting passages) for the breeding of moray eels. Through a wide scale, the tanks were part of a sumptuous Roman Imperial mansion, which belonged to the Emperor Octavian Augustus, the remains of which are still visible on the promontory. 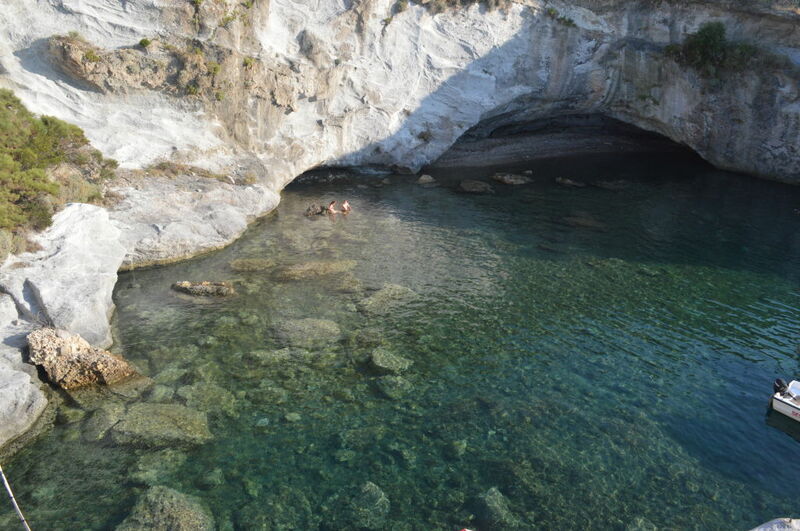 It is possible to visit the pools and explore the tunnels, which are connecting the spots and areas. Sailing forward, you come across the majestic Faraglioni della Madonna (Faraglioni means stacks, spikes of rocks coming out from the water), the Parata beach and the Faraglioni del Calzone Muto (literally: stacks of the dumb pants), so called because of a stone with a shape of pants, set on the rock. The legend says that a shipwrecked sailor threw his pants towards the rock but, being dumb, he couldn’t respond to the call of 2 passing sailors, who wanted to save him. Most likely, it’s just a mineral stone set in the rock, which seems to be changing colour according to the weather. 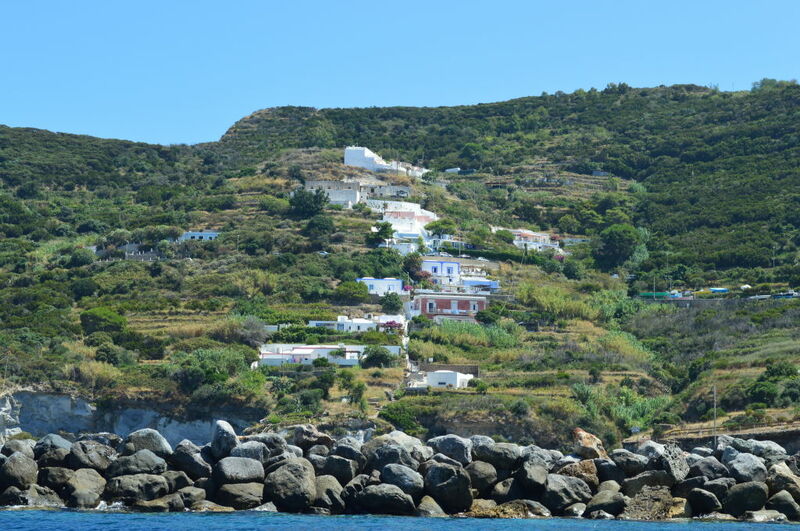 Punta della Guardia is the southern limit of the island and on top of it, the old lighthouse stands, which is now closed, but the guardian was living there with his family until a few years ago. 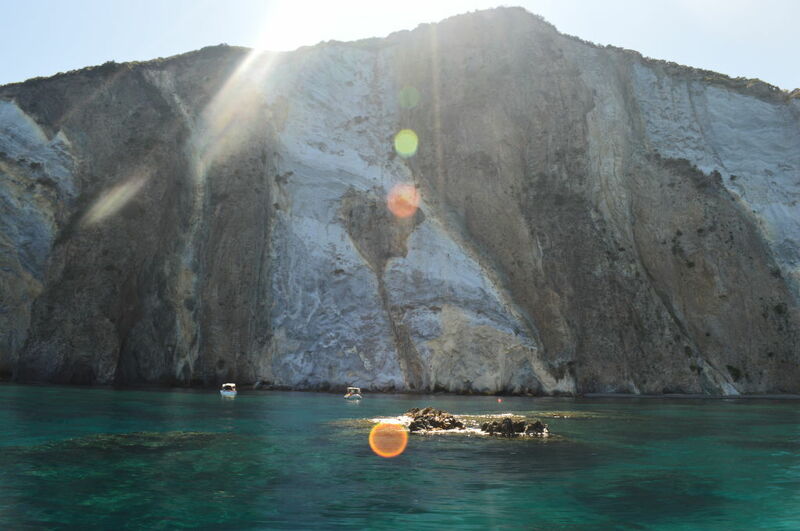 Punta della Guardia, is the turning point to the western coast of Ponza, where the rocks along the cliffs show their multicolour shades from yellow, to red, green, blue and white. 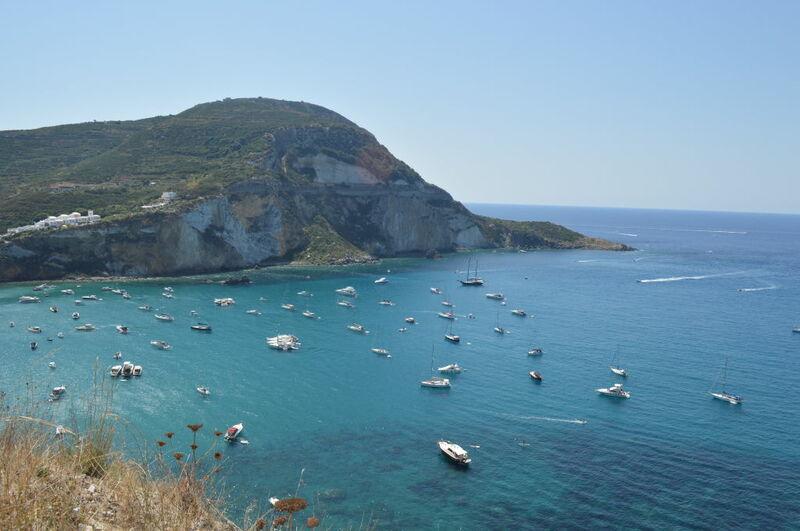 Sailing north, you can reach the astounding beach named Chiaia di Luna, with its sickle-shaped profile and a cliff rising out more than 100 mts reflecting its soft-yellow and grey colours into the sea. 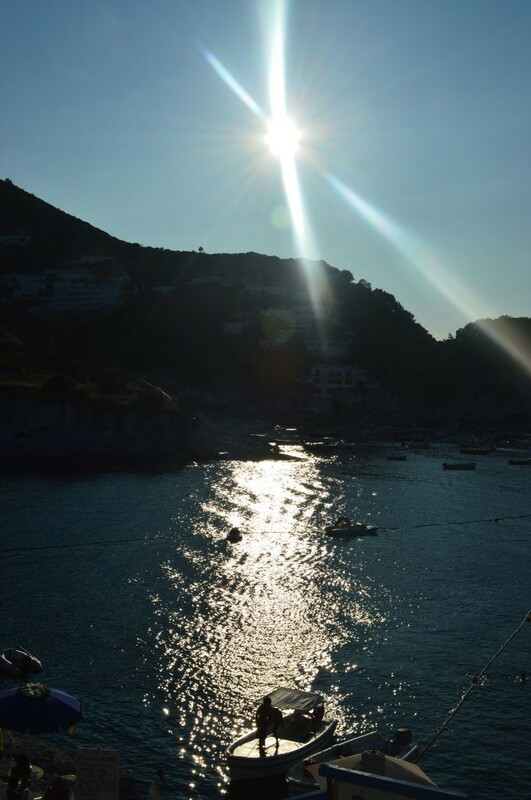 The name of this bay, derives both from its shape (recalling a half-moon) and from the fact that the views are amazing especially during the sunset: it is like watching the show of nature from a natural amphitheatre. Unfortunately, it is currently closed for safety reasons and you can just reach it by boat and bath in front of it only. 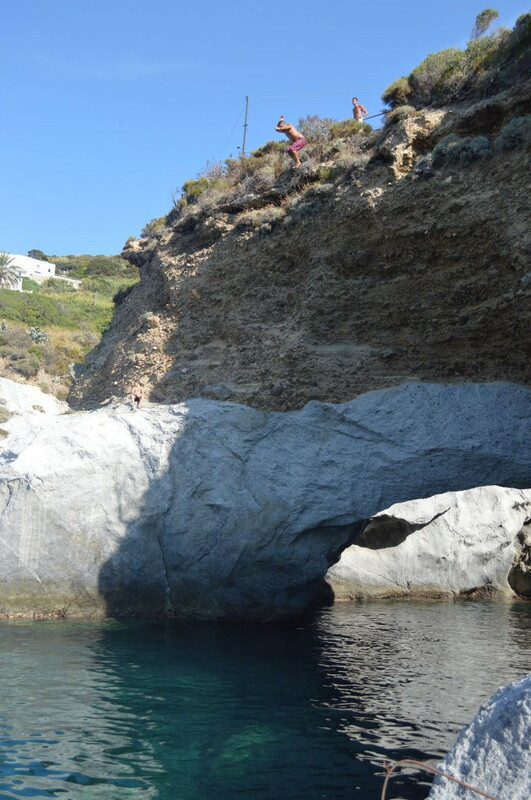 As a matter of fact, the evocative tunnel, built during the Roman times, has been closed, because it is unsafe, as well as the beach, because rocks may fall down. 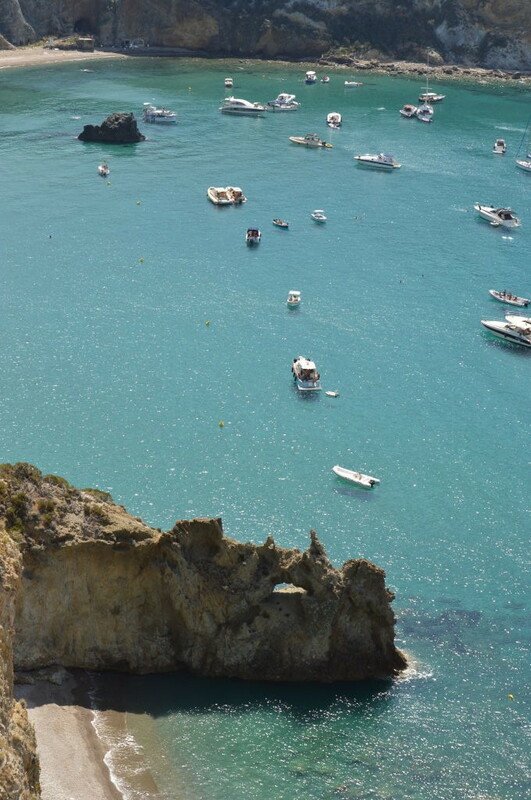 The water here blends from turquoise to deep blue, as far as you get far from the beach and the boats seem to be suspended over the sea, rather than floating. 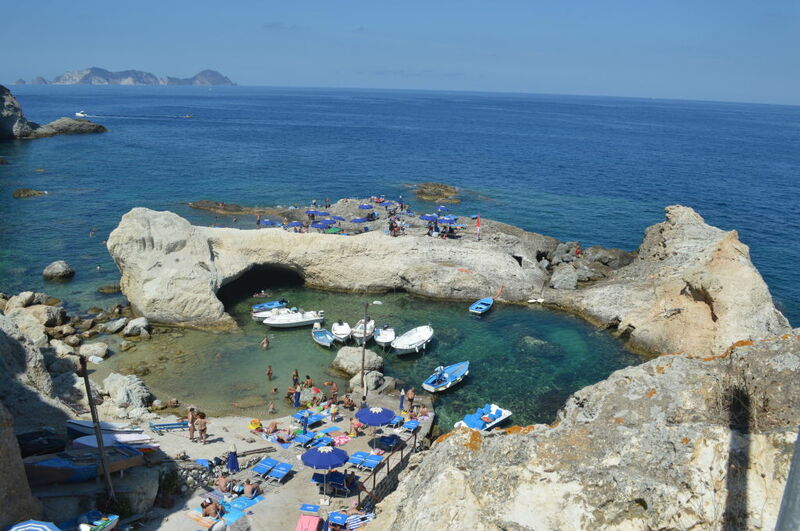 The bay where the beach is placed ends to the north with Capo Bianco, which is characterised by an endless series of inlets and natural caves, which can be seen and reached from the sea only. 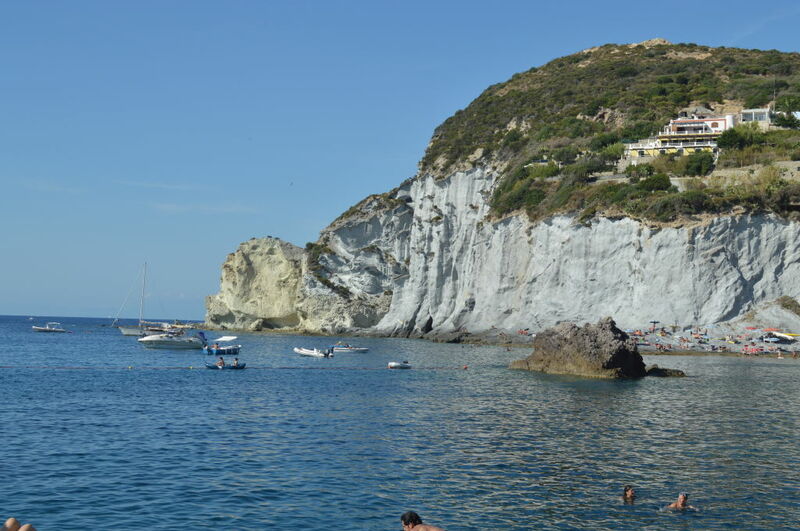 The name of this area (literally: White Cape) derives from the caoline stone white cliffs all around, that bewitched cinema director Federico Fellini, who shot here some scenes for his movie “Satyricon”. 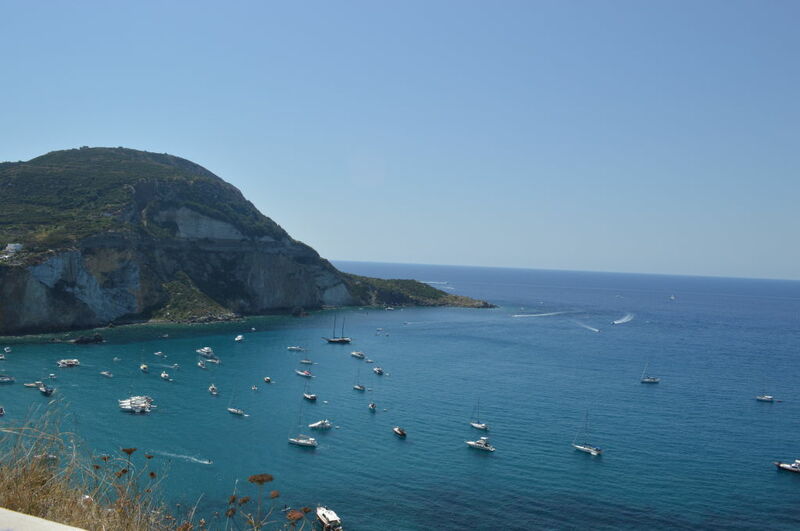 From Capo Bianco, following north, you can arriva at Faraglioni di Lucia Rosa and the sandy Lucia Rosa Beach, that you can reach only by sea. 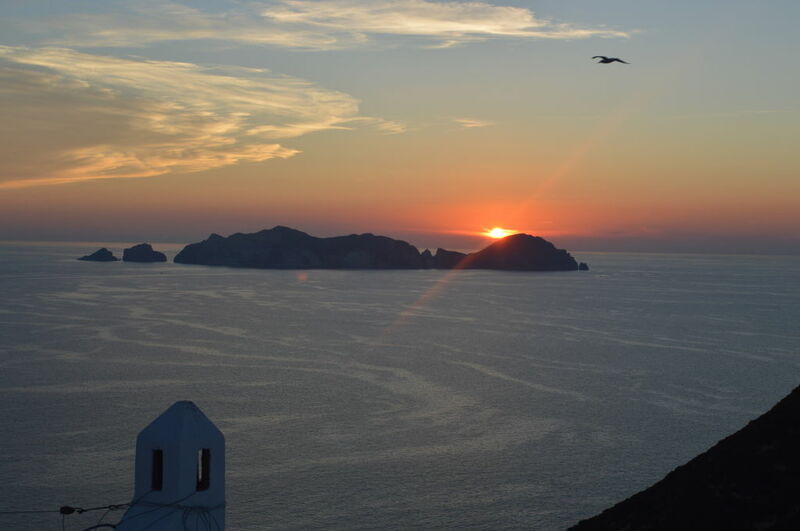 The stacks get their name from a true story of a young woman (Lucia Rosa) who not being allowed to marry her beloved countryman, jumped down the top of the cliff falling on the rocks, being then found by her beloved, unfortunately lifeless. 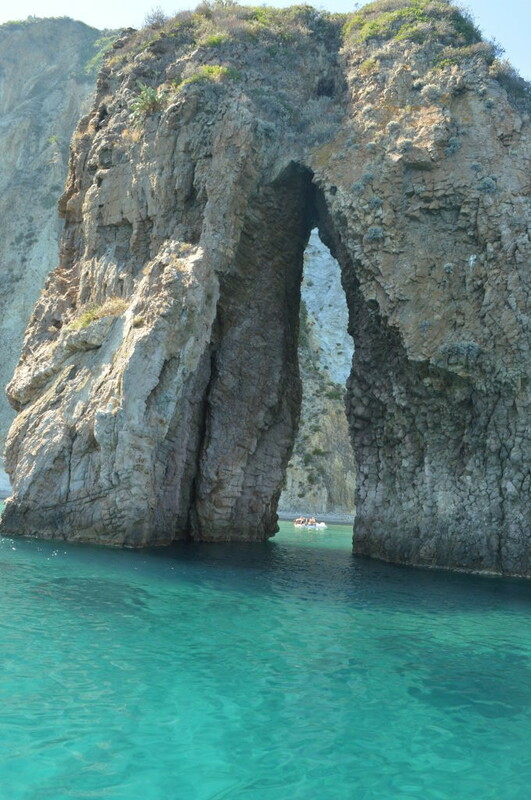 The stacks are characterized by internal recesses caused by the effect of the sea, which then resulted into tunnels, mainly located below the sea level. 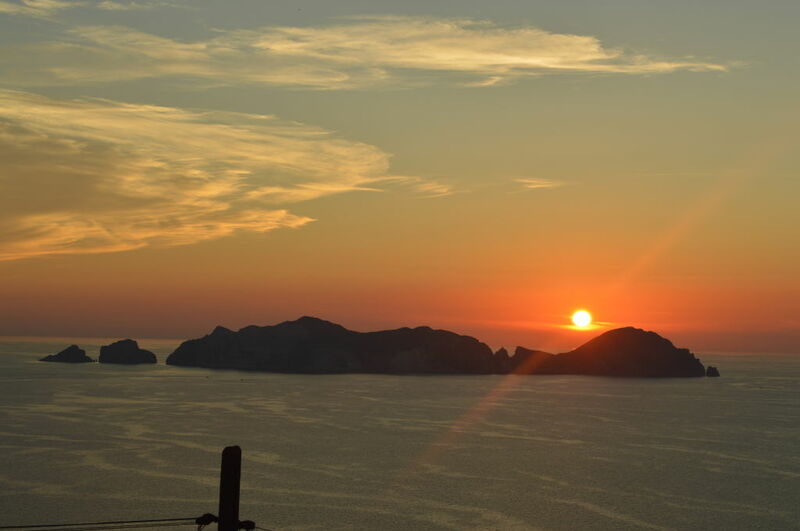 * Lucia Rosa beach is sunny until sunset. 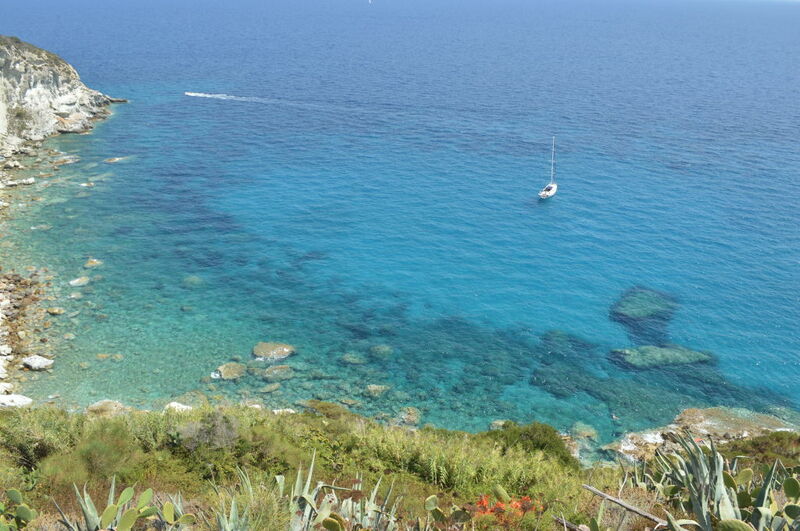 Once you pass this, you can reach Cala Feola and the area of Piscine Naturali (literally: Natural Pools), which are accessible also by land by walking about 300 steps. 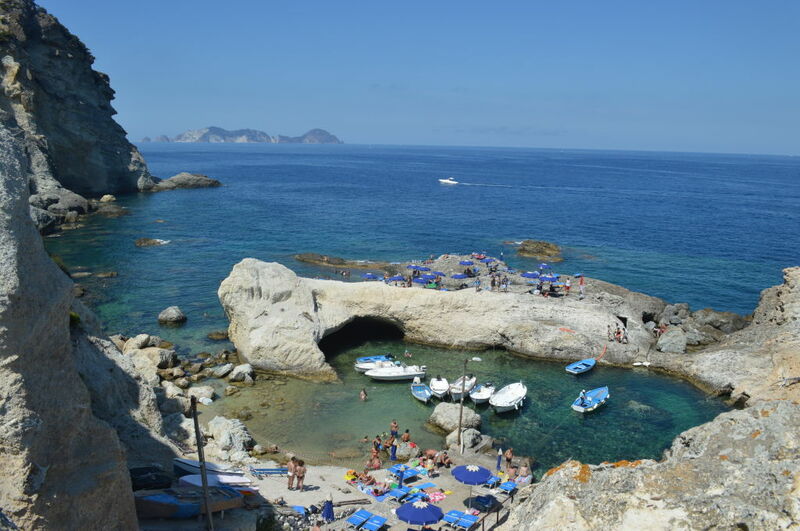 In Cala Feola you can have a sunbath on the rocks, but there is also a small sandy beach, which is good for families with kids. 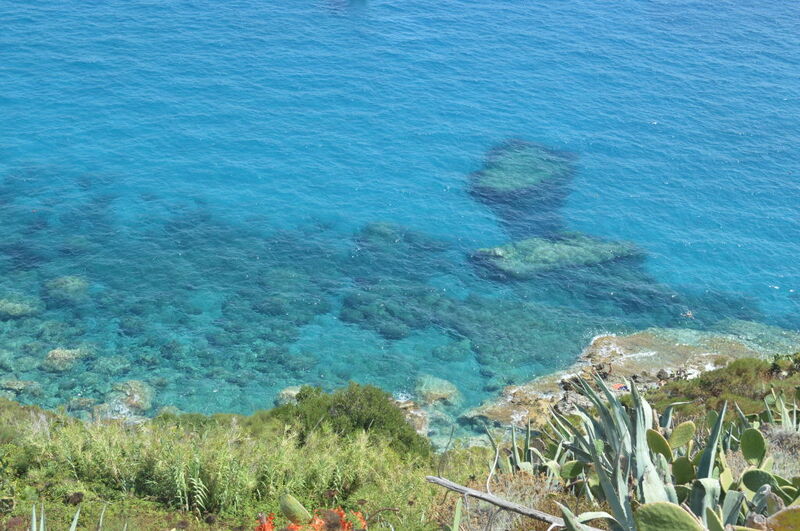 Piscine Naturali, is so called beacause of the action of the sea, which created a few natural pools. Particularly charming, is the area on the left, after the steps, because you can reach by swimming a kind of laguna, probably created by the collapse of the land on top of it, which is now a kind of romantic “open ceiling”. 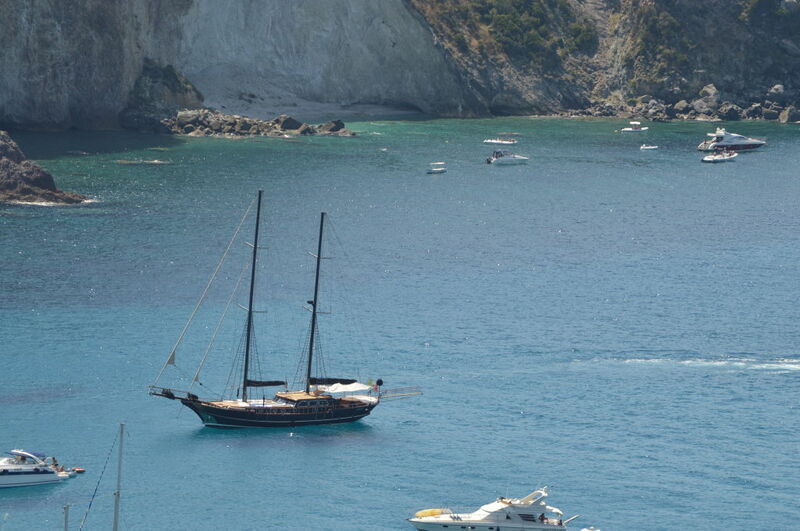 Sailing on, you come across Cala dell’Acqua, with a XVI century bourbon fortress standing on top of the cliff known as Punta Papa. 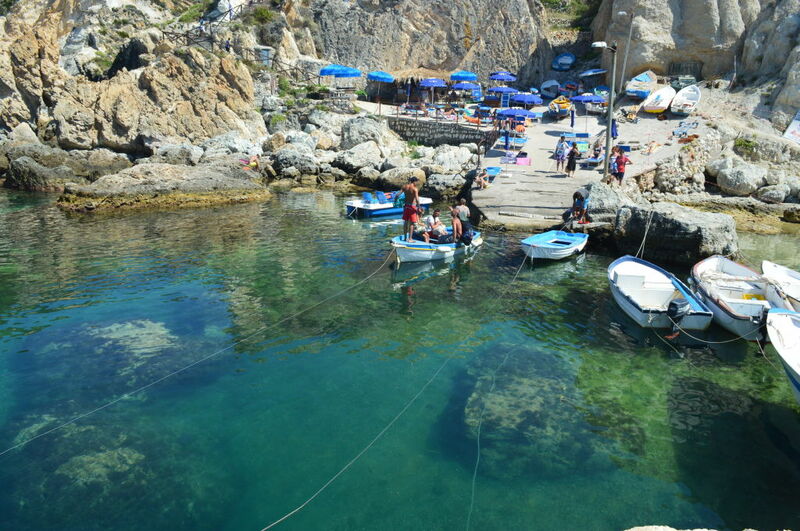 This bay is also accessible by land as well as Cala Fonte. 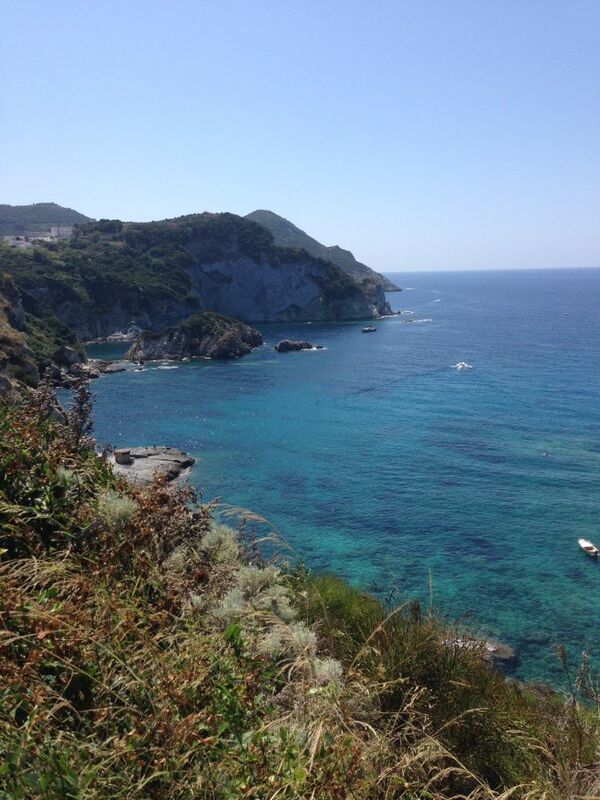 We invite you to scroll down to the “Land Tour” section to read more about these bays. 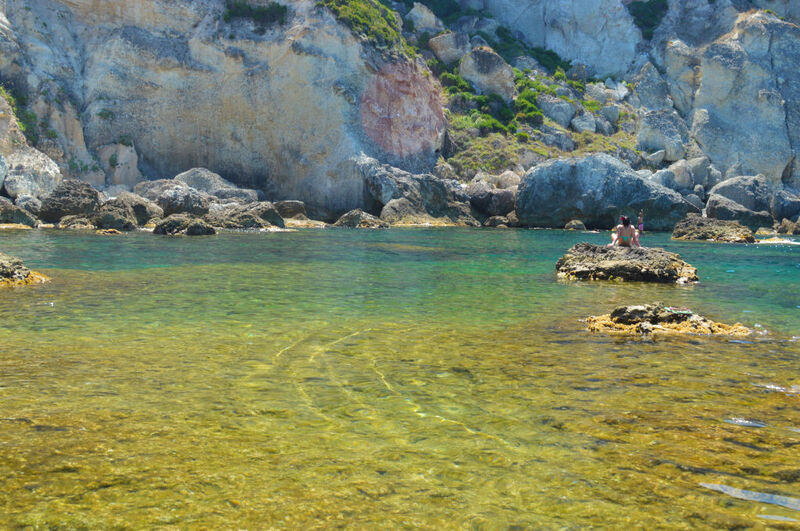 Approaching again the eastern side, you can reach Cala Felci, which is a corner of extraordinary wild beauty, plenty of flourishing rare ferns. 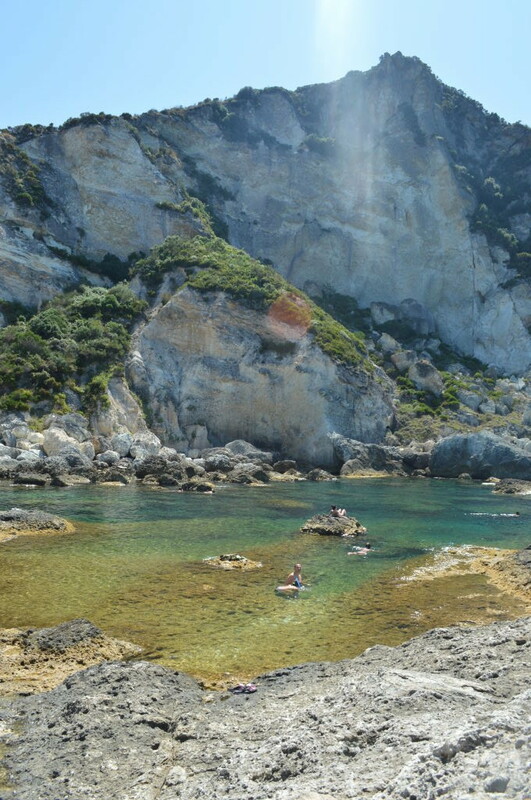 Its small beach, is characterized by sulphureous rocks, that you can scratch and spread on your body to nourish your skin. The legend says, that if you do it, you’ll get 10 years younger… Useless to say…we did it! 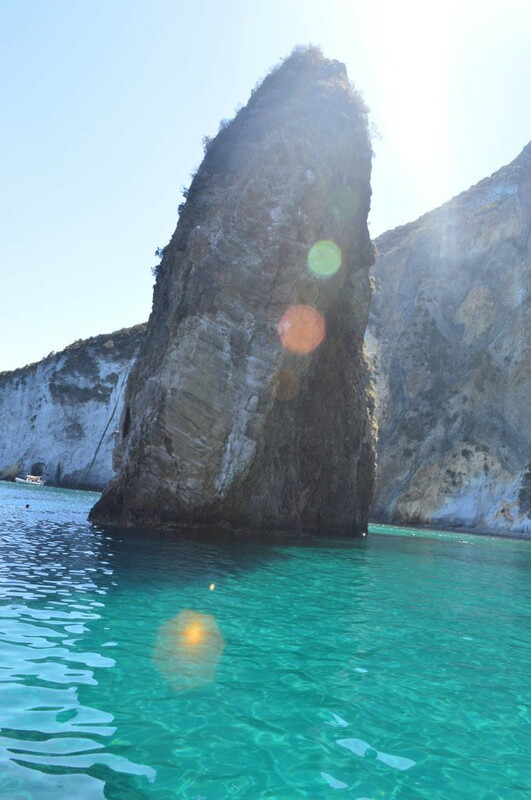 The water at the shore shows a special transparency due to the white rock on the sea bottom. 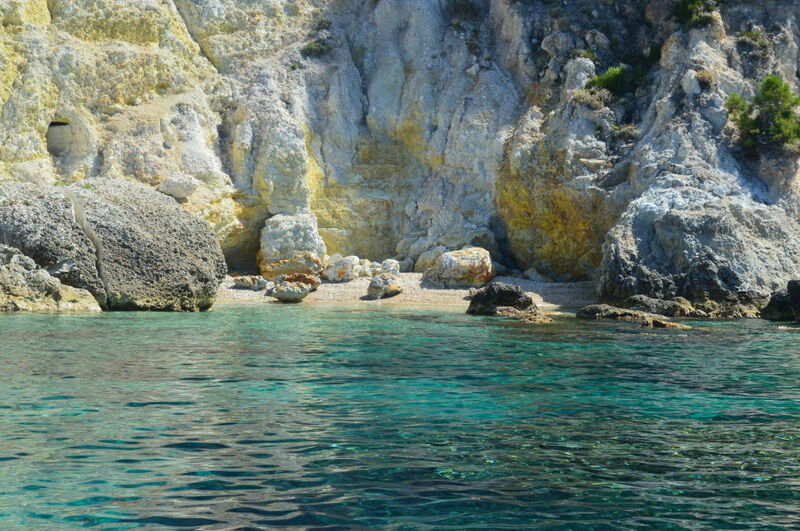 * Cala Felci remains in shadow from 3.00pm. 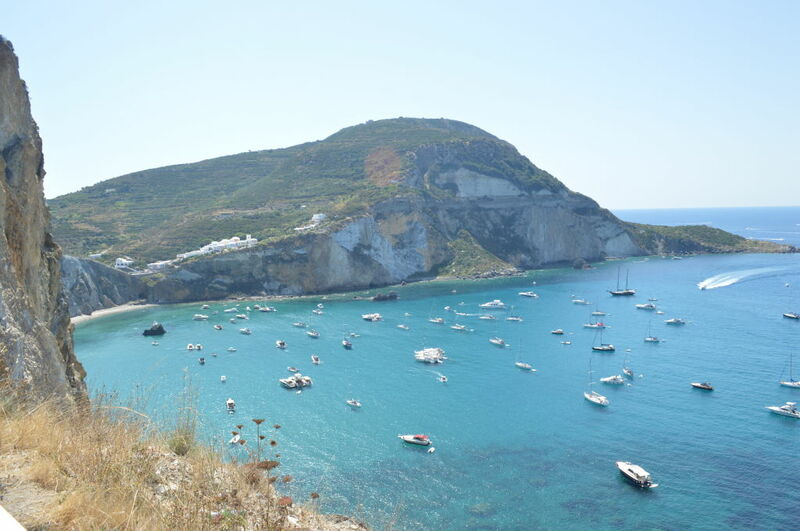 Now sailing down, you can reach stunning Cala Gaetano probably one of the most charming bays, especially if seen from above. This bay can be reached also by land, so you’d better refer to the “Land Tour” section below, to read more about this bay. 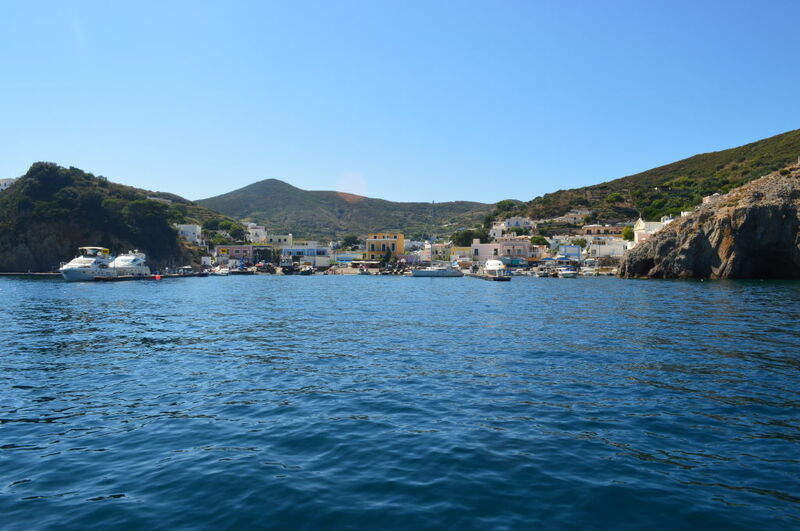 Sailing back to the harbour, you can notice different landscapes from the ones of the western coast: on this side you can admire wide bays followed by promontories, which were named by the local people’s fantasy, giving them the names of old characters or legendary creatures. 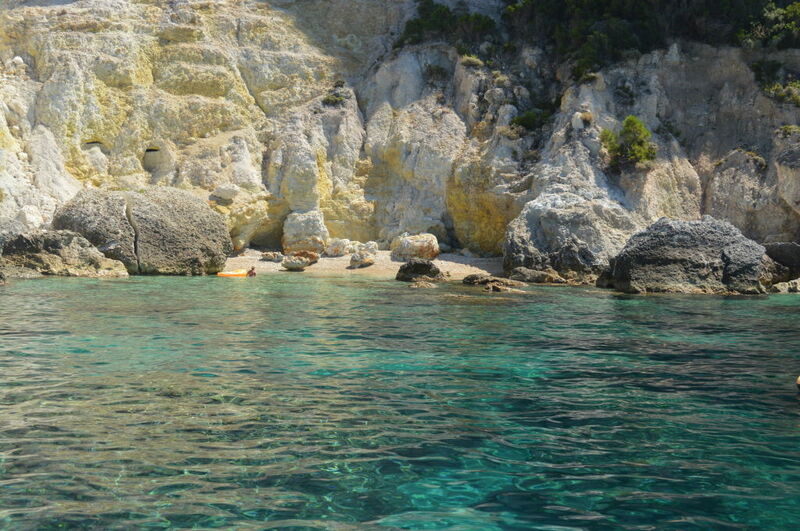 These natural beauties may be toured by sea only, starting from Cala Schiavone, with its majestic natural arch, coming out from a light blue sea bottom, covered with sand and Posidonia bushes. 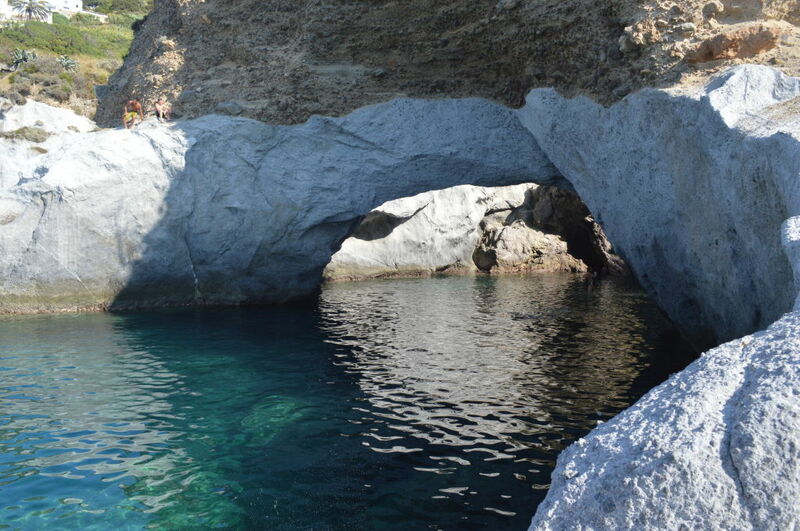 Passed the natural arch, you can see Cala Inferno, one amongst the most striking places in the island, characterized by white tufo rocks, spotted with darker crests, sloping down to the emerald green sea. 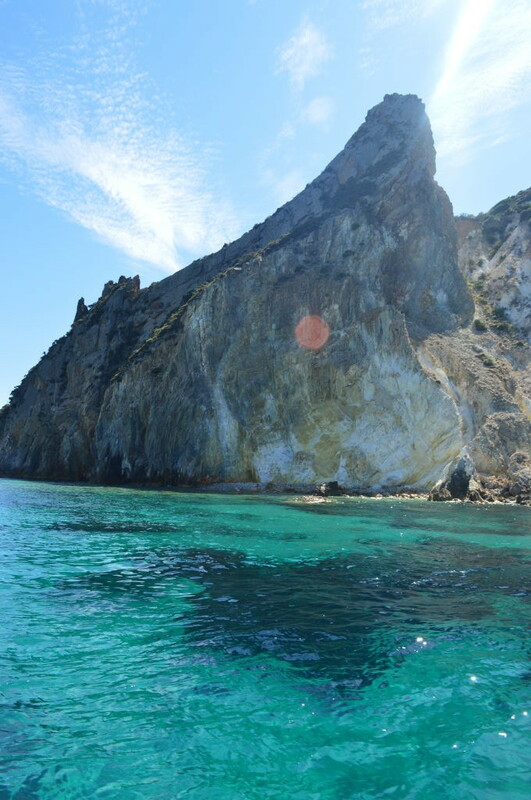 Right beyond, Cala del Core is an elusive gritty beach surmounted by a sheer cliff on which a rhyolitic bleeding heart is engraved. The legend says that Zeus fell in love with a giant and being rejected, he got angry, killed the giant, thore her heart and threw it away against the rock. Most likely, for geological reasons, magma flows out with a shape similar to a heart wounded and bleeding. 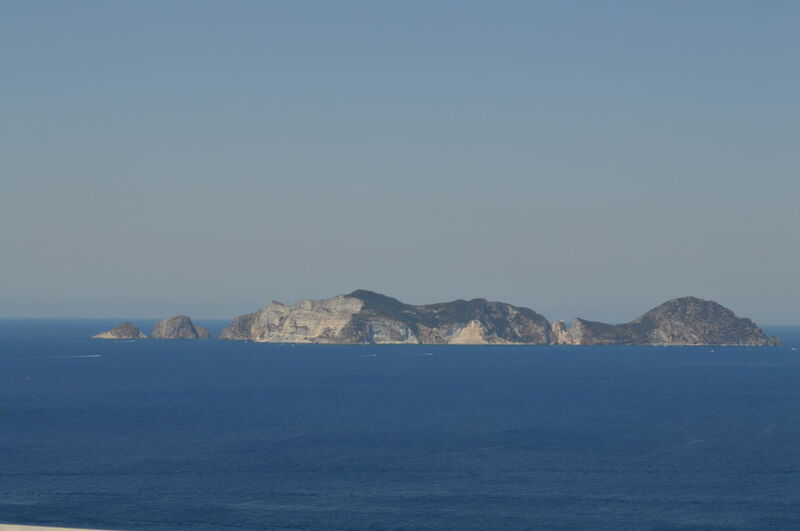 * Cala del Core remains in shadow from 2.30pm. 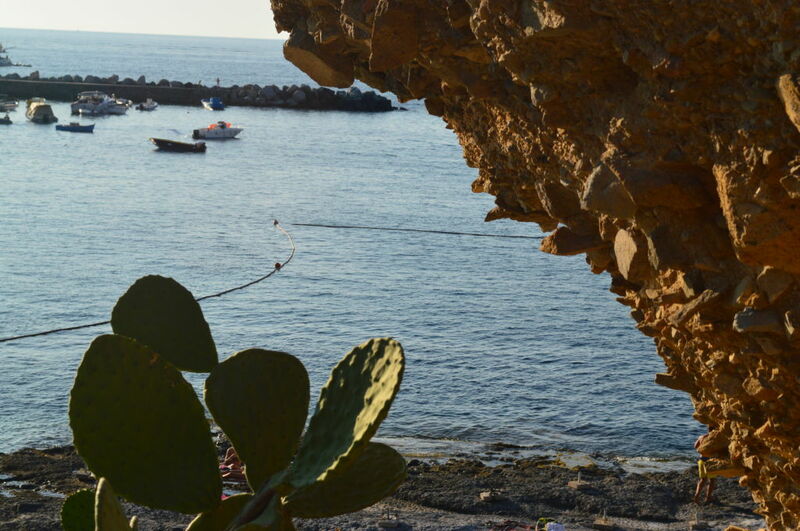 Beyond Punta del Fortino, where a fortress was built in the 18th century, there is the large and gritty Frontone Beach, a perfect place if you don’t feel like walking too much or if you have kids and you need a large beach, with shallow water. 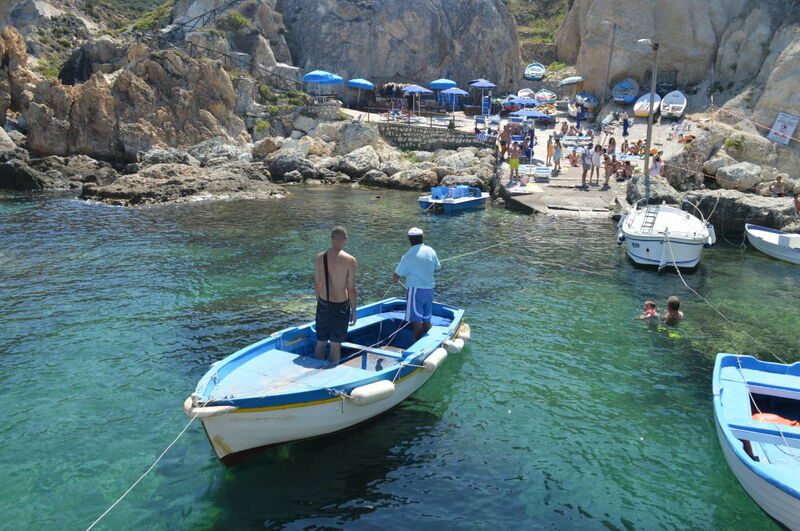 Although Frontone beach is often crowded and it accomodates boats, the water is incredibly clean and chrystalline. 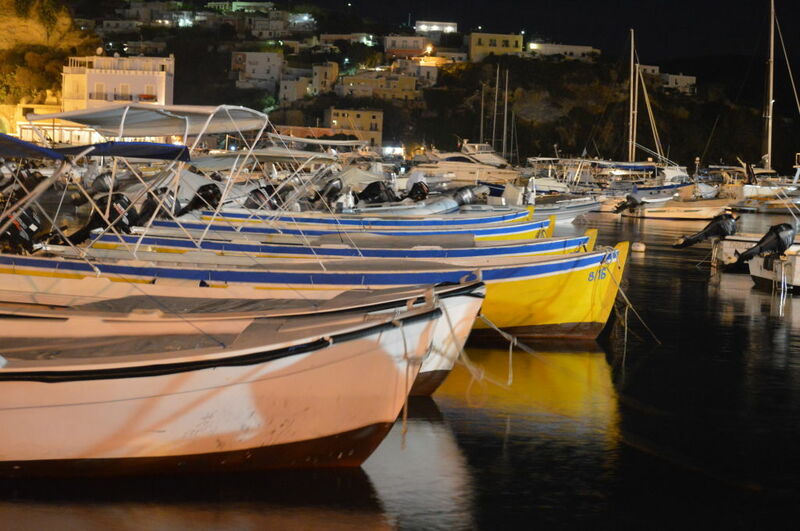 Frontone is connected to the harbour of Ponza with a rapid and no-stop service of shuttle boats. 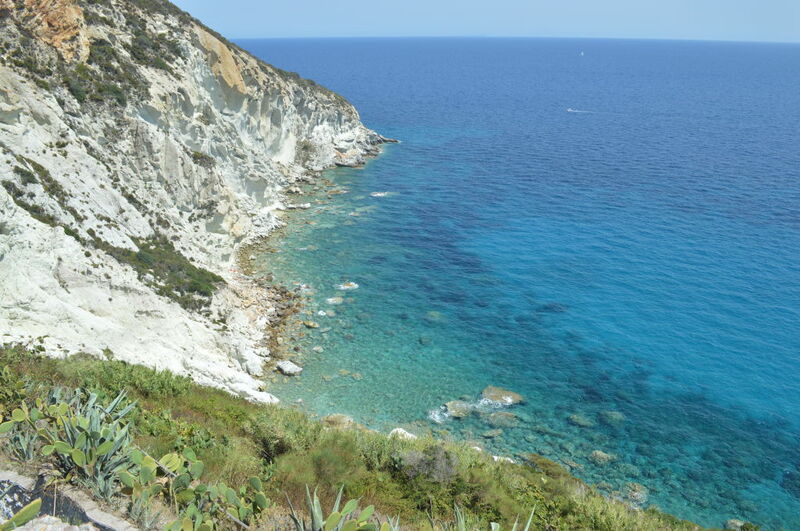 It is also possible to reach the beach by walking from the main road, through a countryside path, surrounded by coloured orange rocks and green Mediterrean bushes. 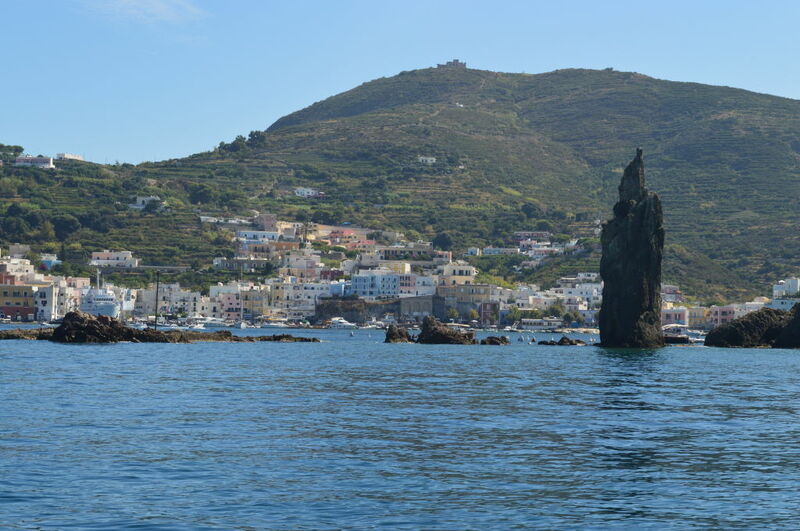 The boat tour ends with the two cliffs leading to the Ravia and Casocavallo, the legendary stack and rock embracing the harbour, where sailormen have created the mythical stories, which increased the charm and the mistery of the island of Ponza. 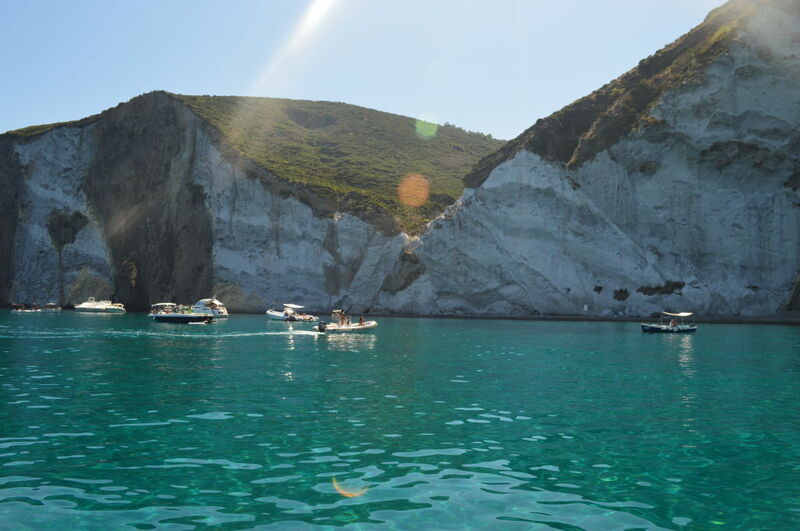 Obviously, while doing the sea tour, you’ll have the chance to dive and bath in the chrystal clear water of Ponza and your eyes will be filled of colours blending from light to deep blue, torquoise, emerald green and all the hues of blue and green you can imagine. 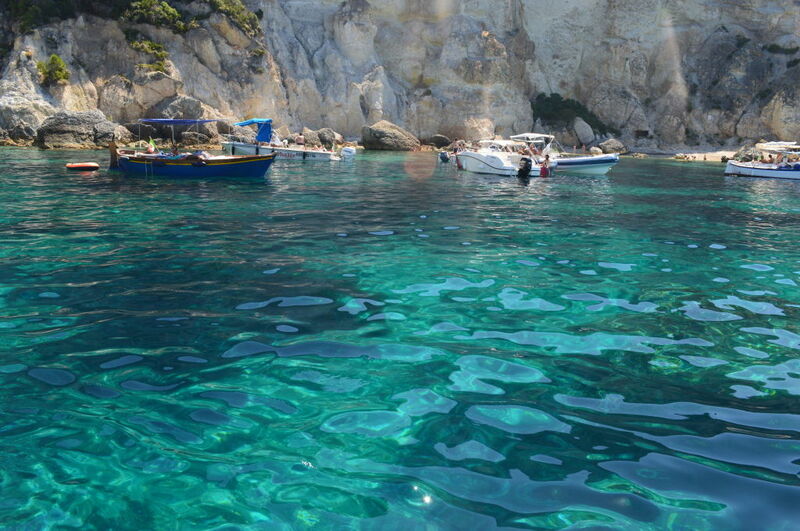 Just watch out the jelly fishes: the water around Ponza is not densely populated with them but, since the water is so clear, they like living in there and you may come across some. 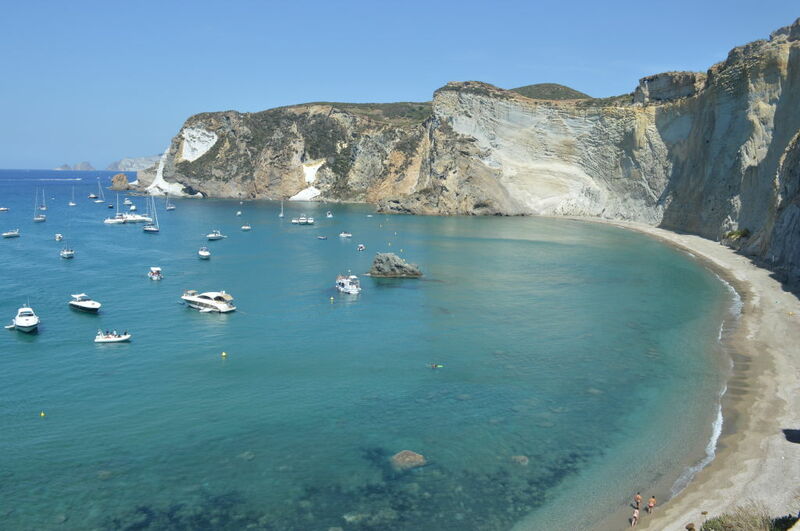 You can visit Ponza and its lovely bays also by land, but you have to know a few things: since everybody can reach these beaches, they are probably the less untouched and wild. You may find that some of them are really overcrowded, especially the easiest ones to reach or the those with sandy beaches. 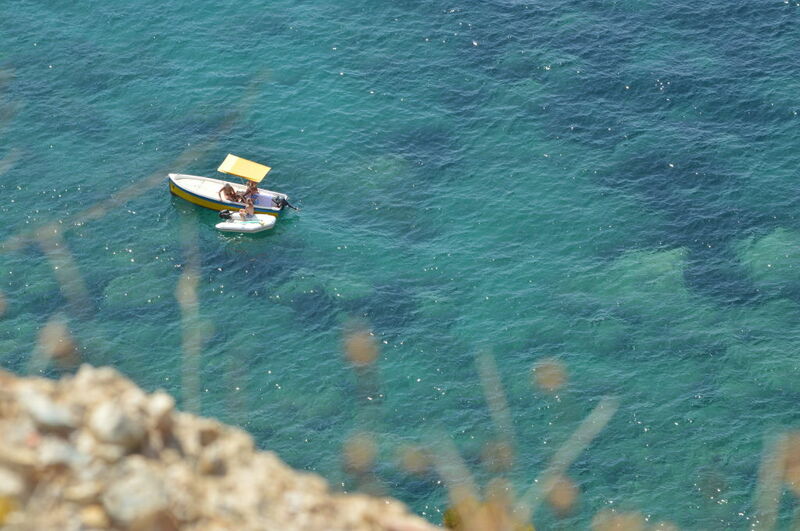 If you need a palette to choose a tone of green, go to Cala Gaetano! This is probably the most charming amongst the bays that you can reach by land and as all the beautiful things, it’s probably also the most difficult to reach, due to its 300 steps. 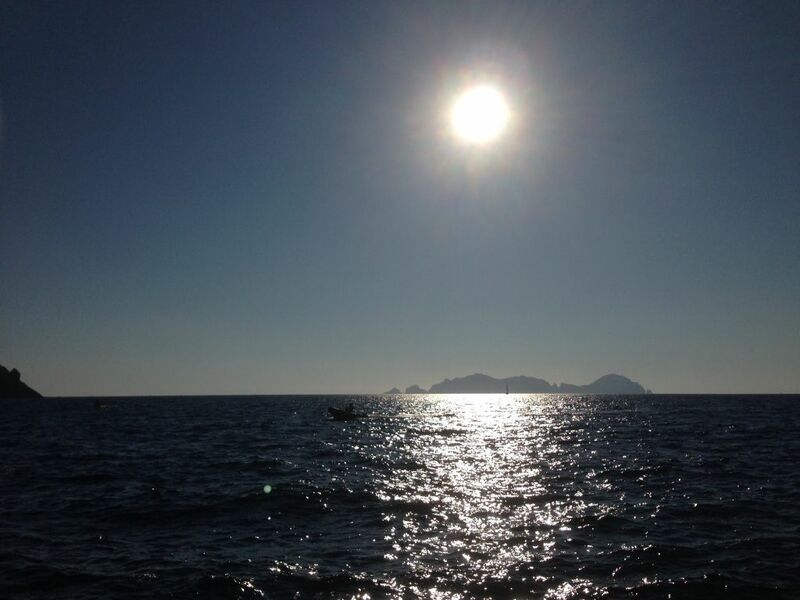 Yet, if you want to spend a relaxing day in this paradise, the place is definitely worth the effort! Moreover, if you like scuba diving, this area is good, since the sea bottom is quite full of life. Cala Gaetano is perfect also if you like taking pictures: especially from the top of the bay, you can take amazing photos of this unique panorama, stretching as far as the eye can see. * It remains in shadow from 4.00pm. We may define this bay as “different”! 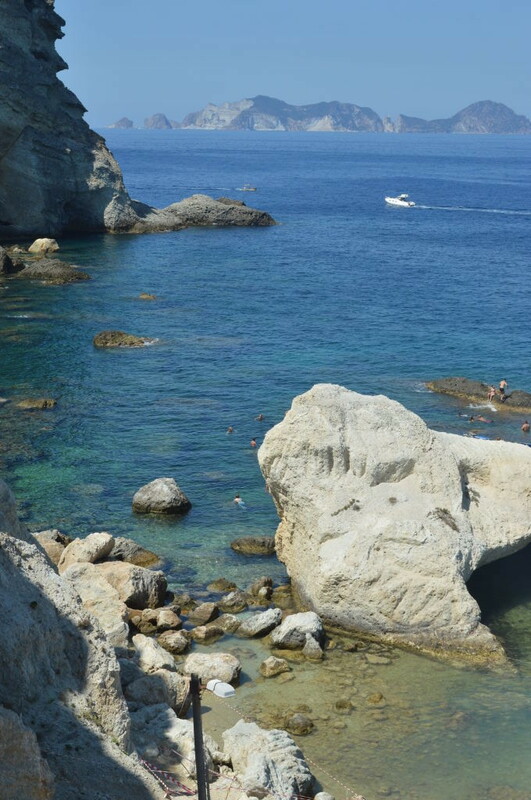 Cala Fonte is characterized by a huge rock in front of the beach: it is quite close to the mainland, but not enough to reach it on foot. 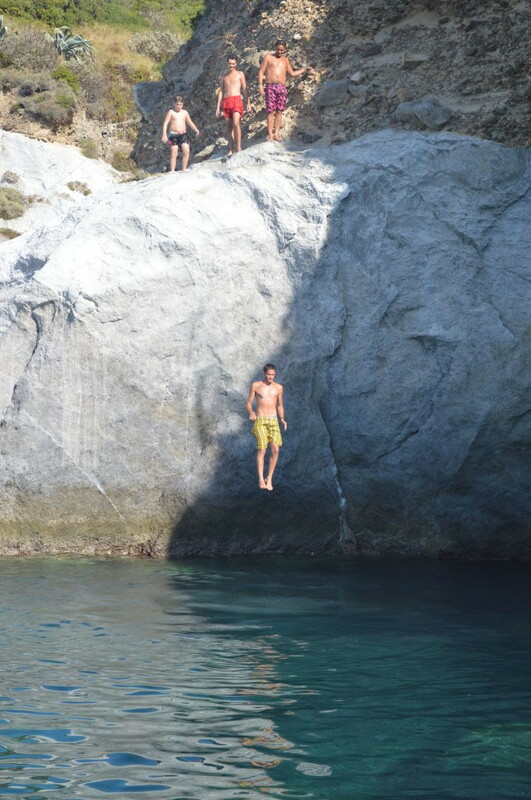 You may swim, but what if you have all your bags, mobile phone and other stuff with you? No problem: Caronte is waiting for you and with just 1 Euro, you can be shipped to and fro the rock! Caronte (Charon in English) is just a surname taken from the Greek myths, being the ferryman of Hades who carried souls of the newly deceased across the rivers Styx and Acheron that divided the world of the living from the world of the dead. Watch the video here. 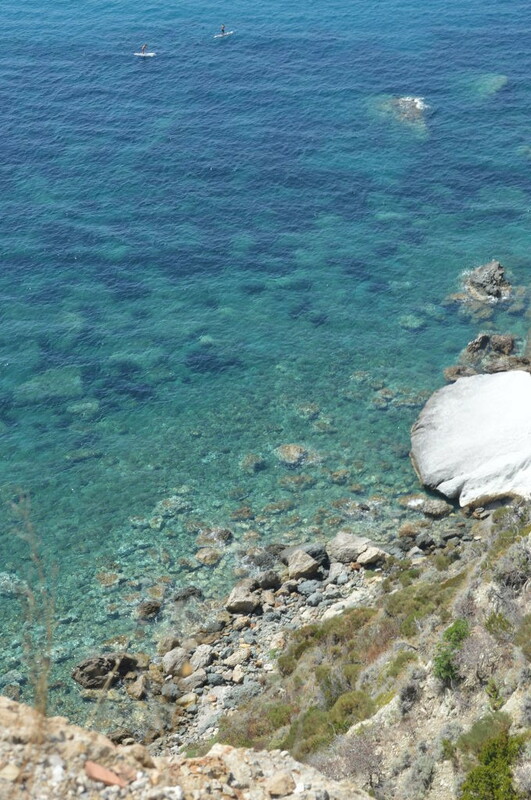 Once you’ve reached the big rock, you can decide whether to lie down or stretch out on a beach lounger. 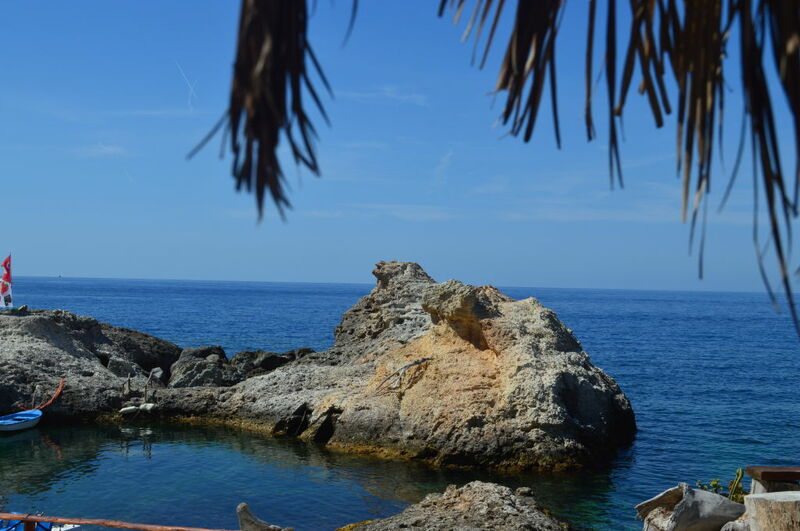 In Cala Fonte there is a bar (U’ Russulillo), offering you several services: for about 15/20 Euros you can rent a beach umbrella and two loungers and they bring you food and drinks to you, so that you don’t have to take the boat every time you need something from the bar. 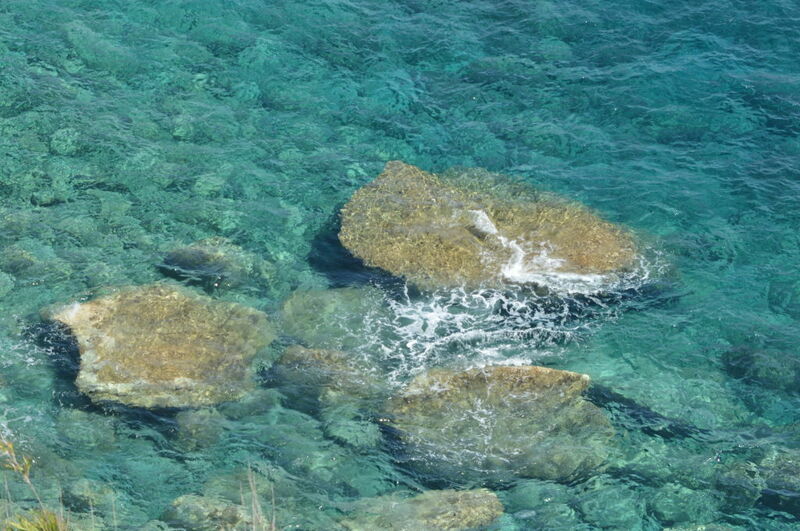 Water is chrystalline and you can dive from the rocks or stand in the shallow water before going far from seashore. The area is rich of crabs and other fishes, so you can also meet lovers of underwater fishing, trying to catch something to eat for dinner. 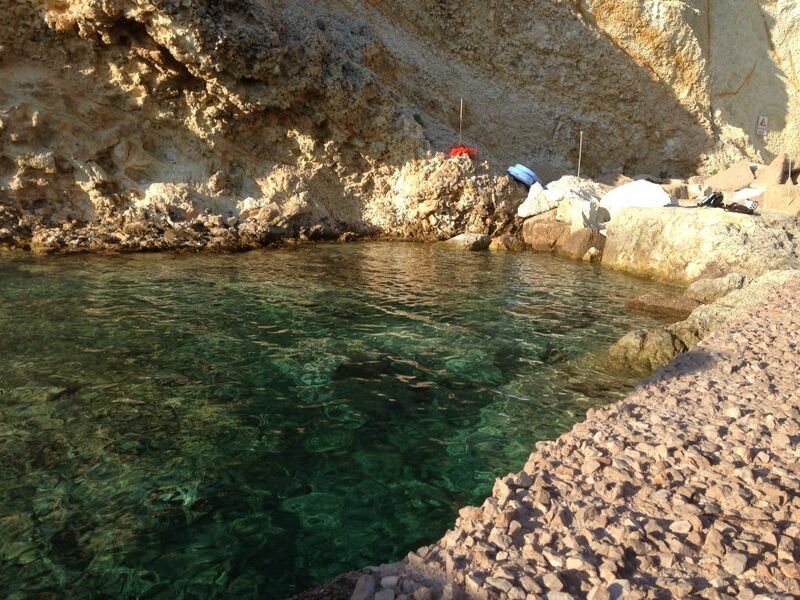 * Cala Fonte is sunny until sunset. You can reach this bay walking a path with steps down to the sea. 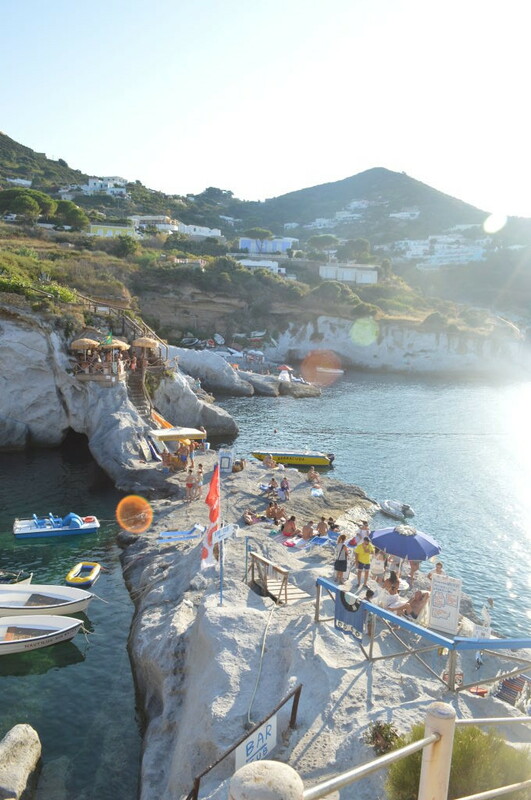 Here you can choose to lay down on the rocks and bath in the deep water, but consider that this bay is a good dock for boats, so there is not a huge space to swim, unless you pass through the boats and swim further. 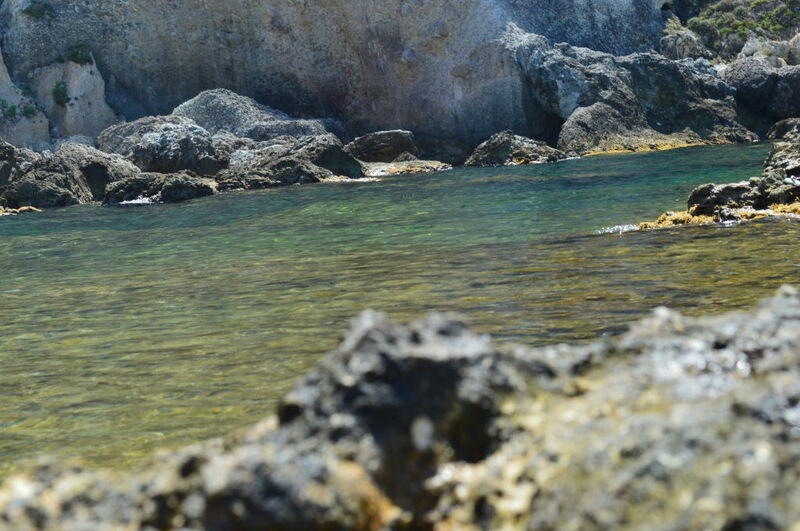 On the other hand, you can reach the small sandy beach: this part of the bay is perfect to relax especially if you have kids, because they can bath barefooted and the water is not deep. The beach is equipped with beach umbrellas and loungers, that you can rent. Obiovusly, being so comfortable, it’s a bit overcrowded but this is the “price to pay” for sandy beaches! Finally, on one side of the beach, there is a bar with pergola, where you can have something to drink or eat, or just sit down under the shade. This is the place where you can ask for umbrellas and loungers for rent. 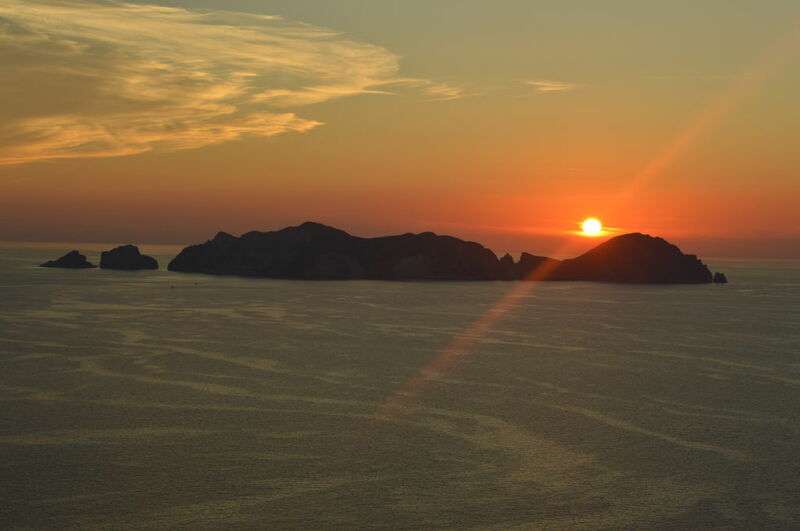 * Cala Feola remains in shadow from 4.00pm. 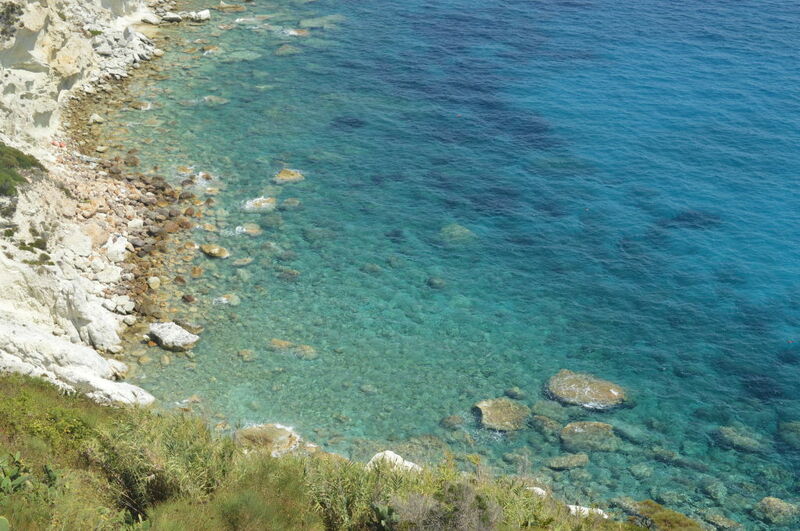 Right beside Cala Feola, there is another lovely bay, whose name is Piscine Naturali, which means “Natural Pools”. 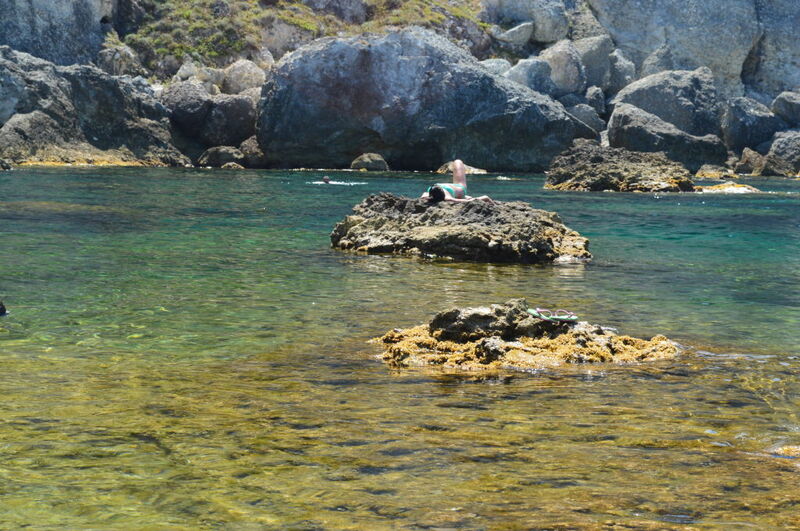 No need to wonder why: the action of water, over the centuries, has created a kind of natural pools, not accessible by boat, creating something similar to lagunas, where you can swim and imagine to be shipwrecked on an exotic island, just like a movie. 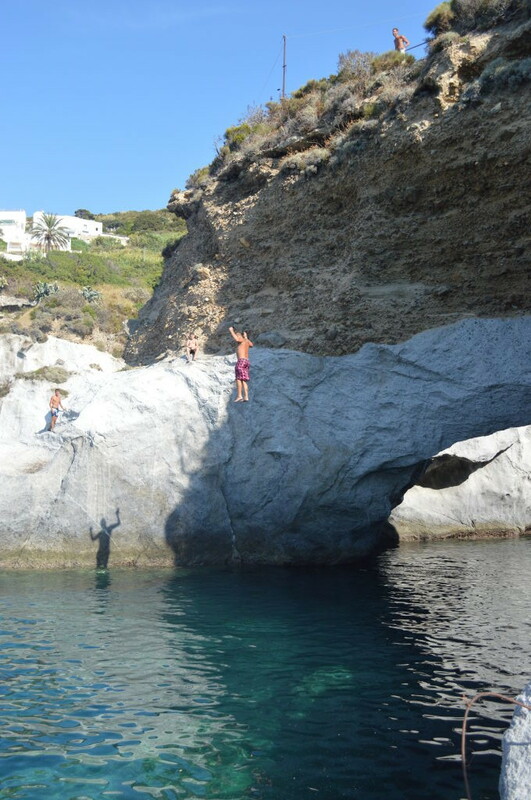 In this area there is also a big rock, very suitable for diving and indeed you can see quite a lot of people practicing various kind of dives. 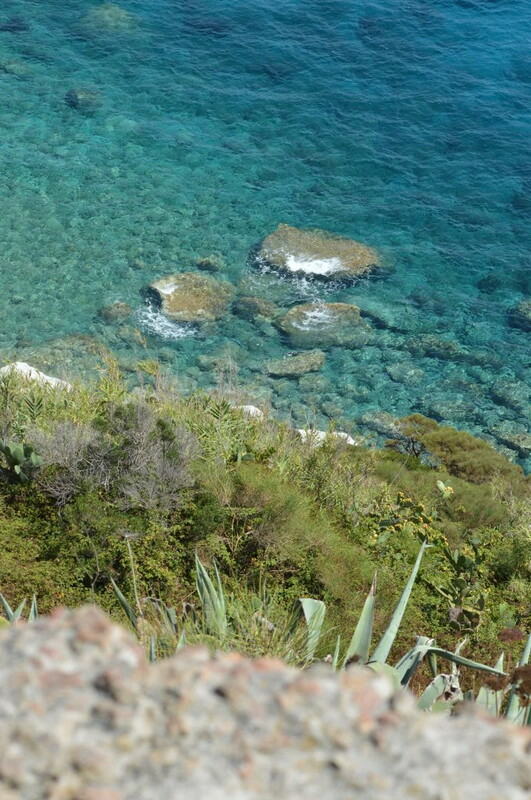 If we have to say it all, from the path leading to the beach, there is a break and some people are diving from there. 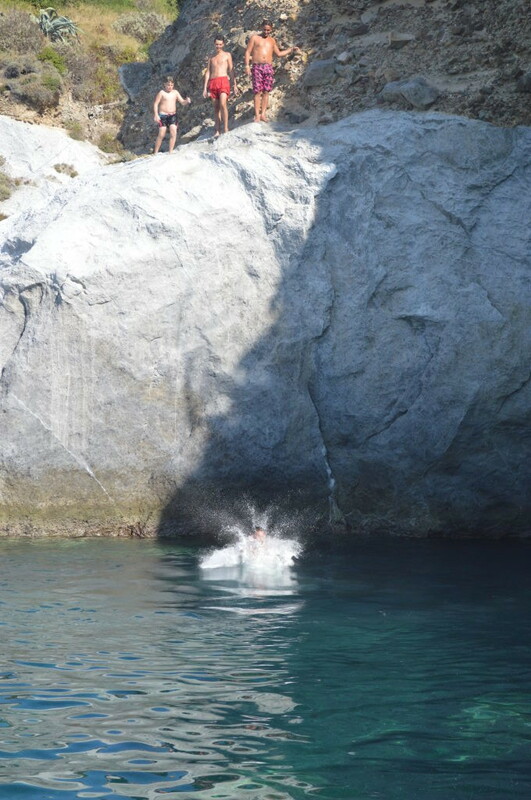 Yet, we warmly recommend you not to do it because diving from there is not allowed and because it is really very high and it may be dangerous. 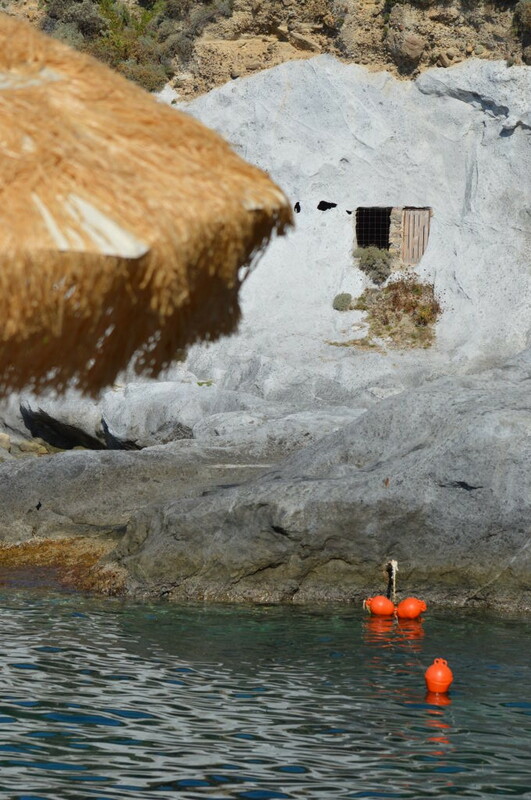 Although the beach is rocky, you can still rent a beach umbrella and a lounger. 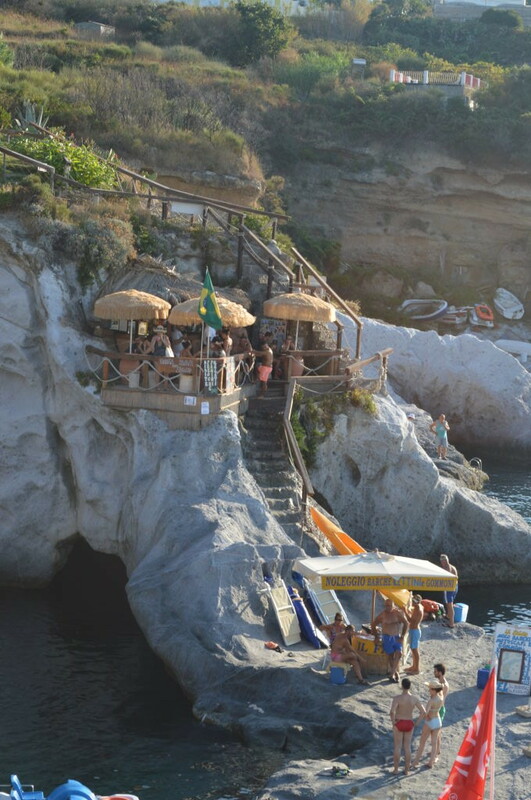 In the area, there is also a nice wood bar, perched on the rock, where you can enjoy an aperitif in front of a breathtaking sunset. 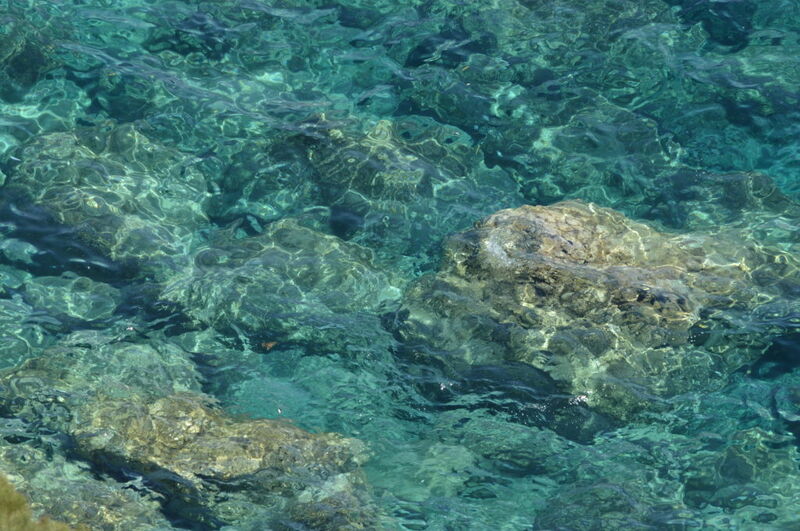 * Piscine Naturali remains in shadow from 4.00pm. This is probably the easiest beach to reach, since you have to walk a paved road first and a sandy path then, but with no steps. 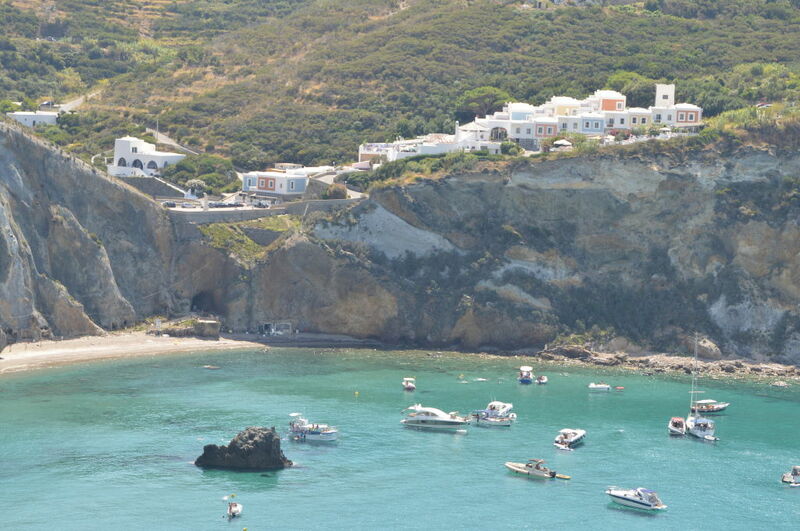 As all the other beaches in Ponza, the water here is chrystalline, clean and shading from green to deep blue. 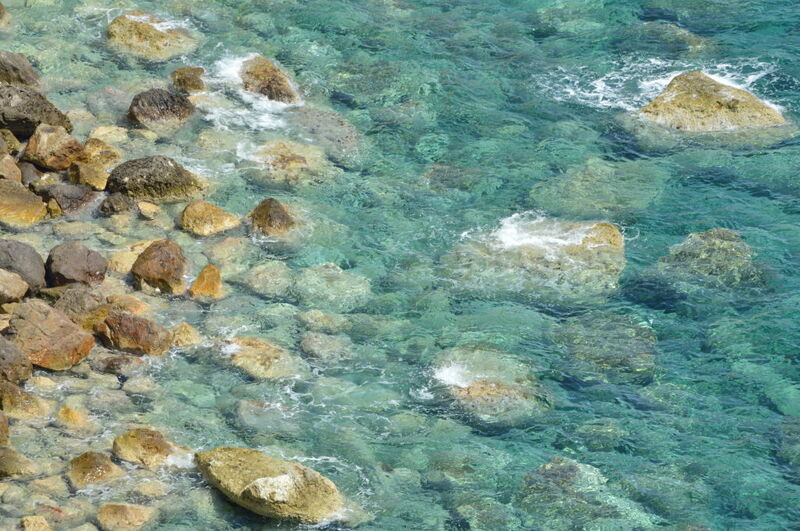 Here you can swim in the deep water or stay inside a small natural pool. 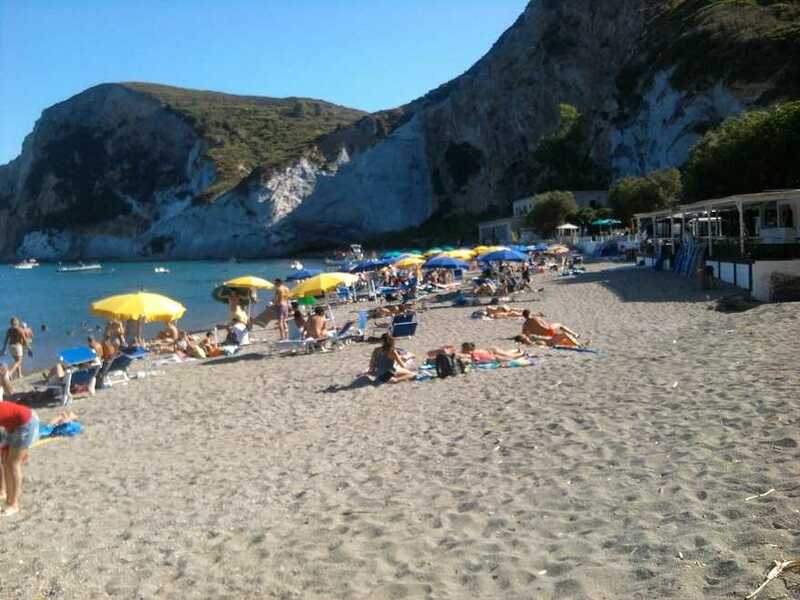 The beach is rocky but provided with beach umbrellas and loungers that you can rent for about 20 Euros. 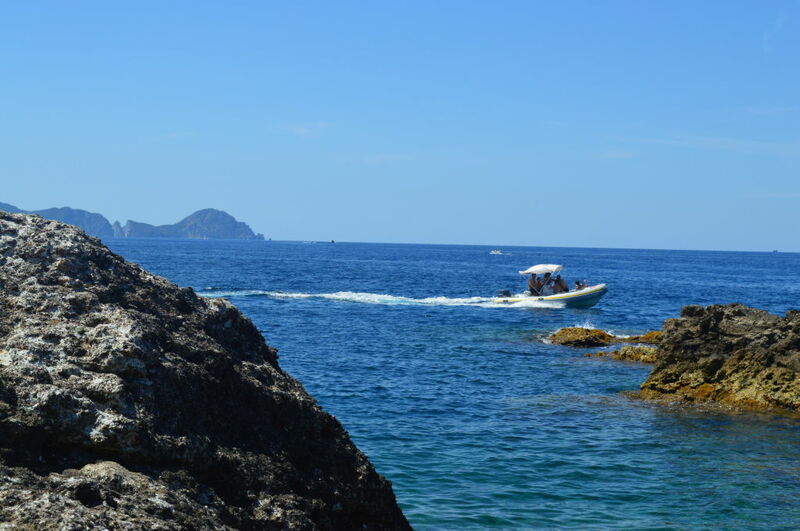 We recommend to reach the platform (you can’t see it when you arrive, because you have to walk behind the rocks) because from here you can enjoy a full view of the open sea and if you decide to stay until sunset, the show will be unique, with the profile of the island of Palmarola stuck in front of you. 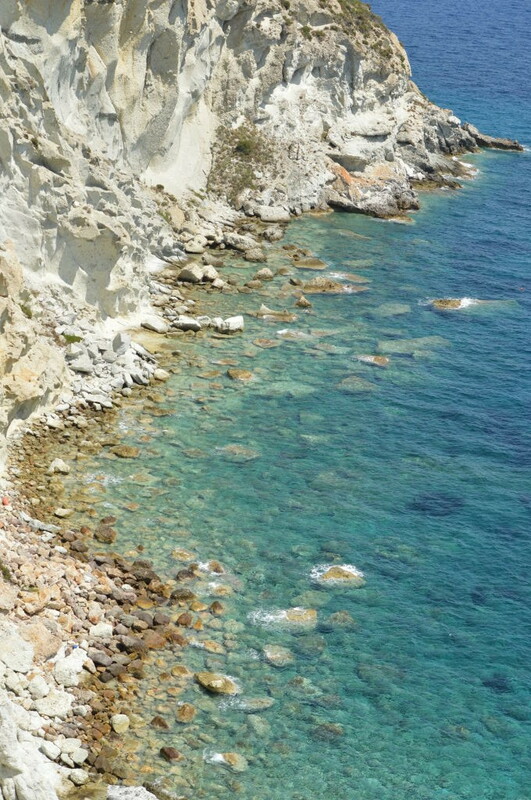 Yet, we have to advise about a con: Cala dell’Acqua is the place of a dismissed mine and for the past 40 years it has been in the same conditions. So you can see the old cement structure of the mine and some iron blocks (now rusty) are still stuck on the rocks, so you have to be careful when you walk on the rocks. It’s not really dangerous for adults because the iron blocks are very visible, but we don’t recommend this place to families with kids. 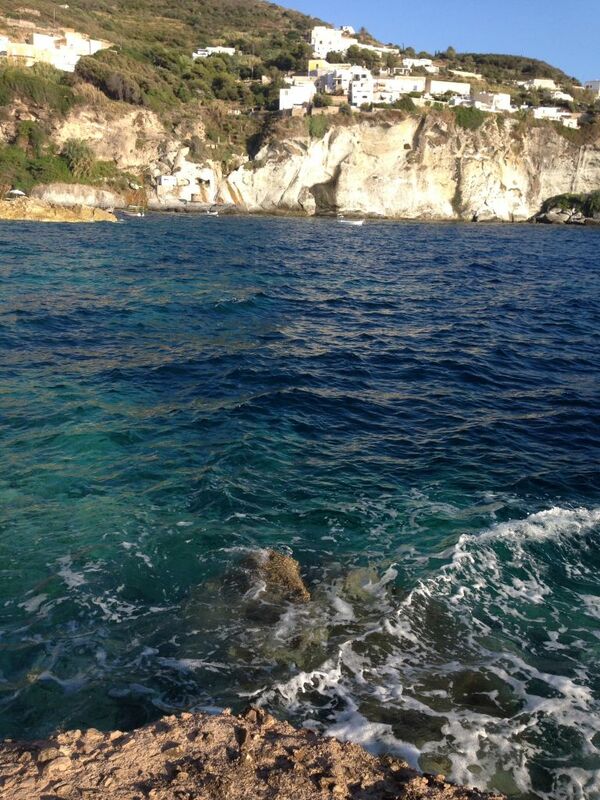 * Cala dell’Acqua is sunny until 30 minutes before sunset. 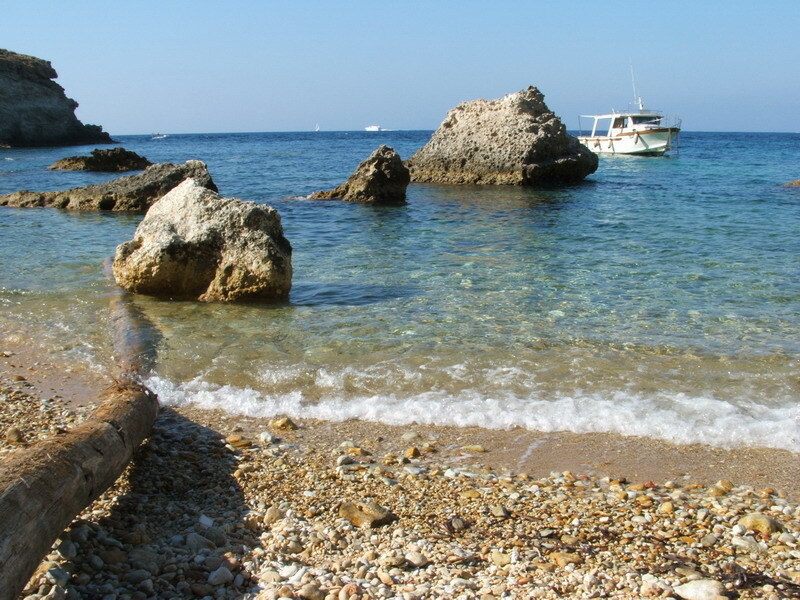 This is another perfect beach for families: not only you can reach it by walking a countryside path, but there is also a boat shuttle service connecting the port to the beach. Frontone beach is wide, gritty and surprisingly its water is chrystal clear, despite the sand, the boats and the people that every day pack the beach. Well equipped with beach umbrellas and loungers, that you can rent to spend a full day in total relax. 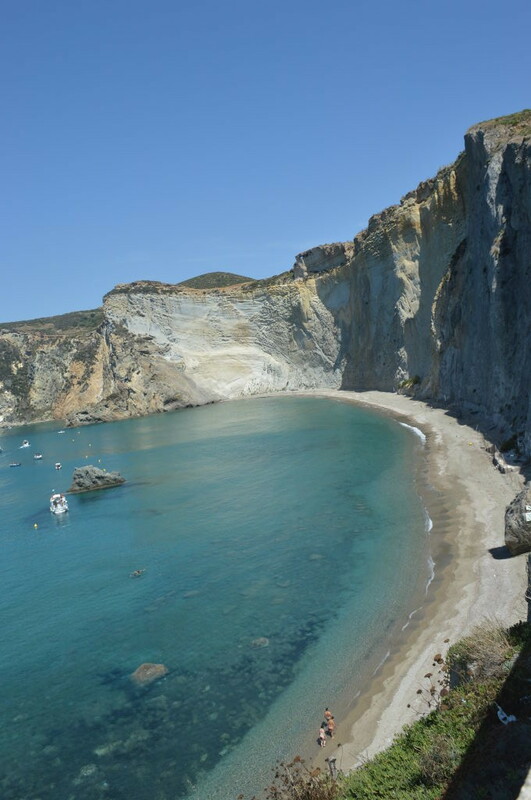 Frontone beach takes its name from the shape of the white tuff similar to the “pediment” of a greek temple. 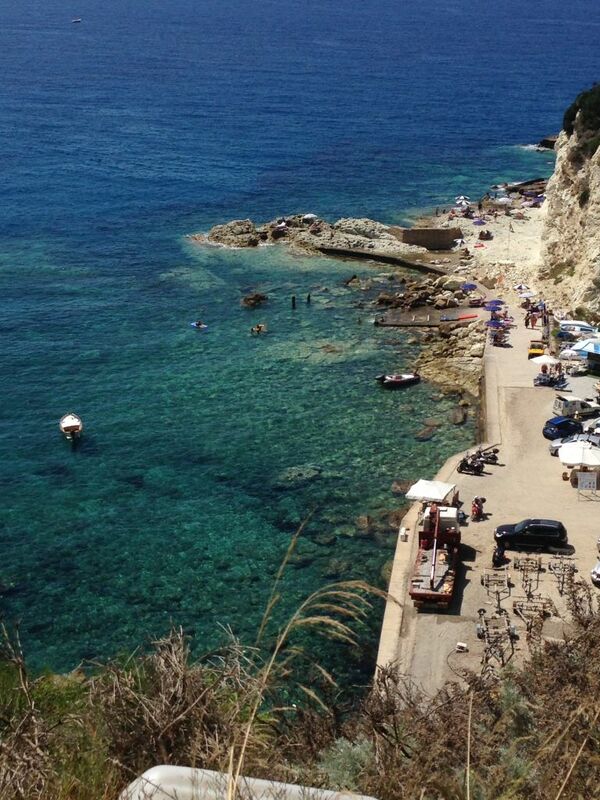 * Frontone Beach remains in shadow from 5.00pm. 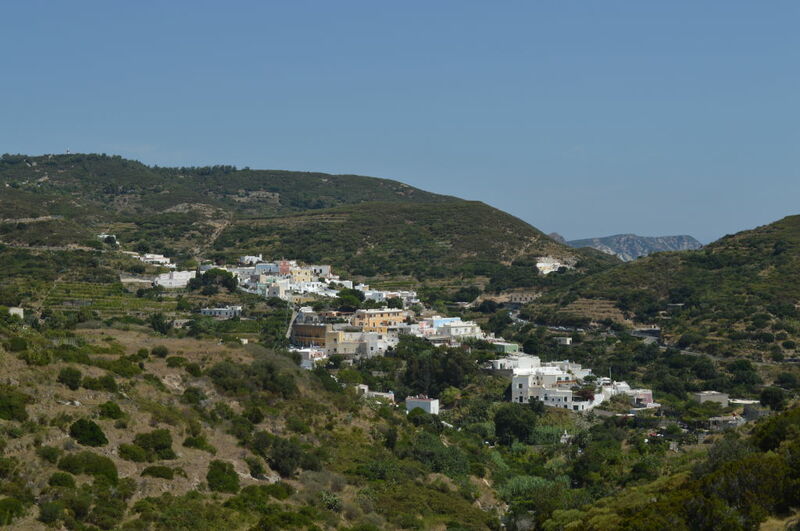 From this area it is clearly visible the greek-roman aqueduct tunnel that from Cala dell’Acqua came up to the town of Ponza. 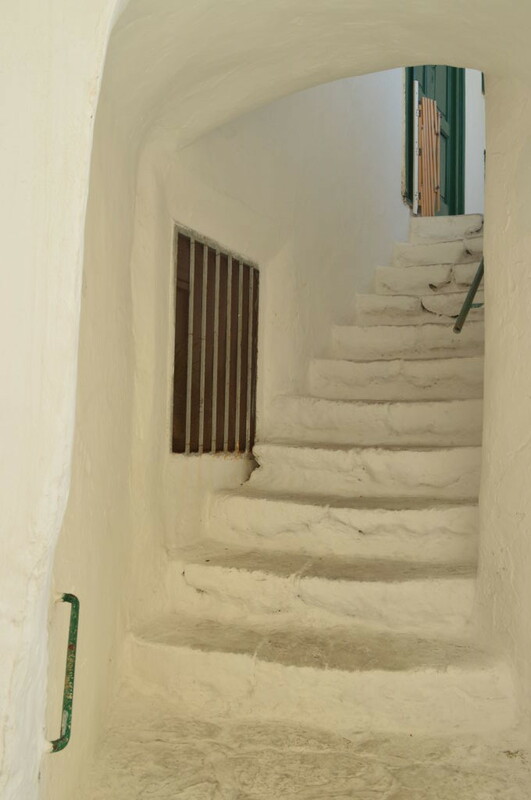 In the second half of the 18th century, big steps were excavated in the rock (still used today), to reach the homes of the settlers from Torre del Greco, who settled in Le Forna. Next to the houses there is a path leading to the village of Le Forna. 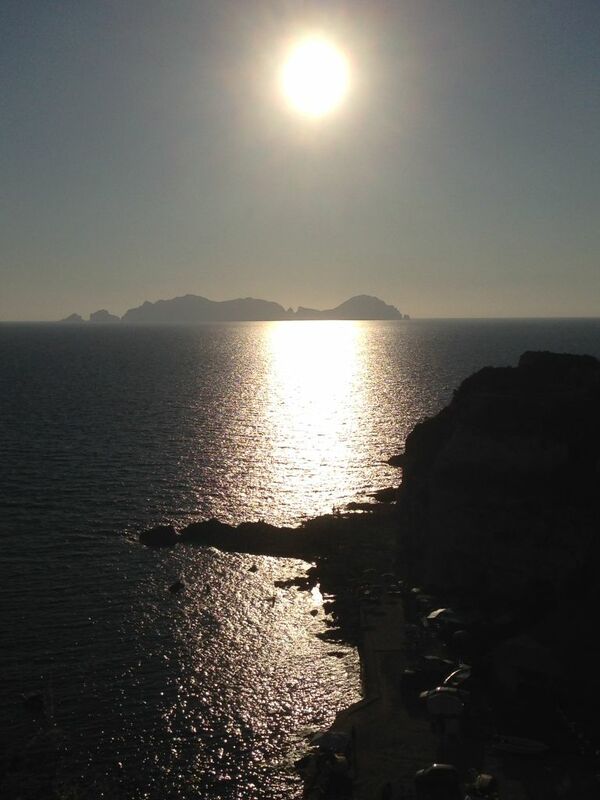 * Cala Inferno remains in shadow from 4.30pm. 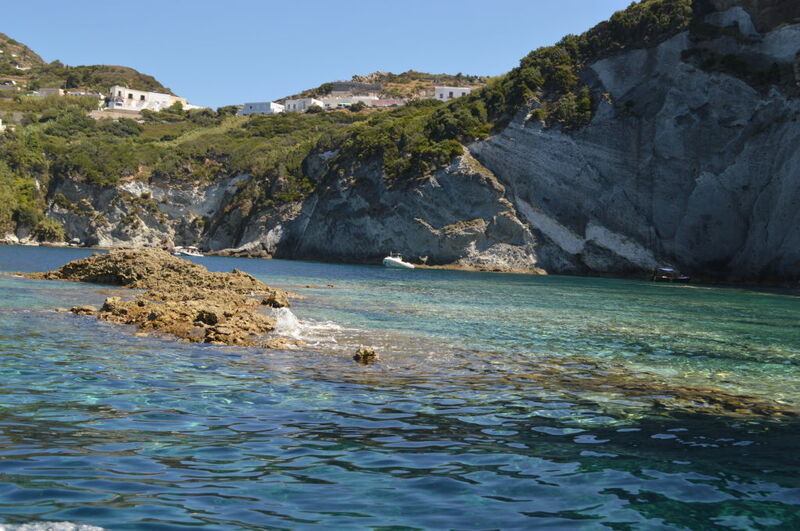 Although they probably represent the most charming part, beaches, sea and bays are just a part of a whole that make Ponza a dream place for your summer holidays. 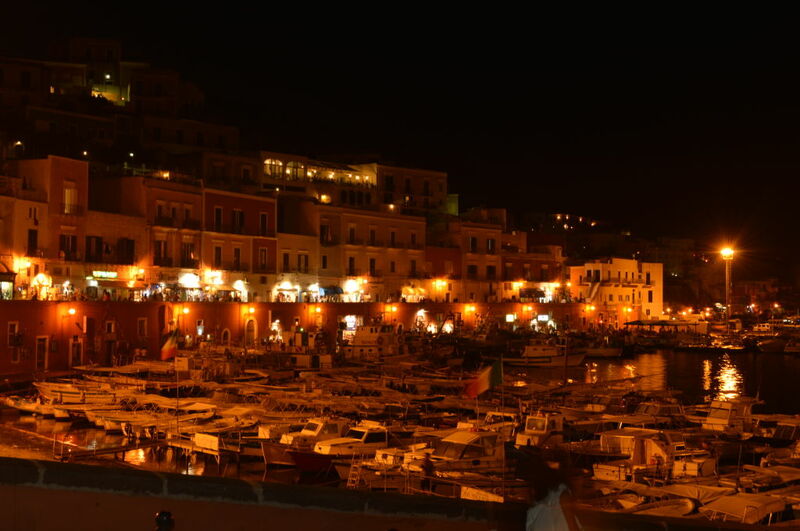 The area of the harbour itself, with its multicoloured buildings and the boats floating below the town, is an essential element, giving its contribution to create the magic all around. 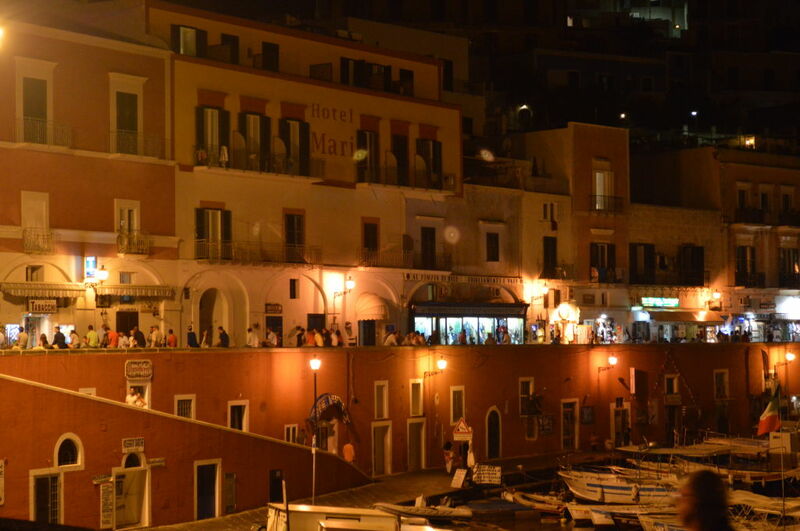 The town center is quite small and it basically develops around the harbour: in the quay area, you can mainly find shops selling boat tours, while the road above is the promenade, where people walk or just sit on the wall having a drink from one of the several bars, especially at night before going clubbing somewhere. 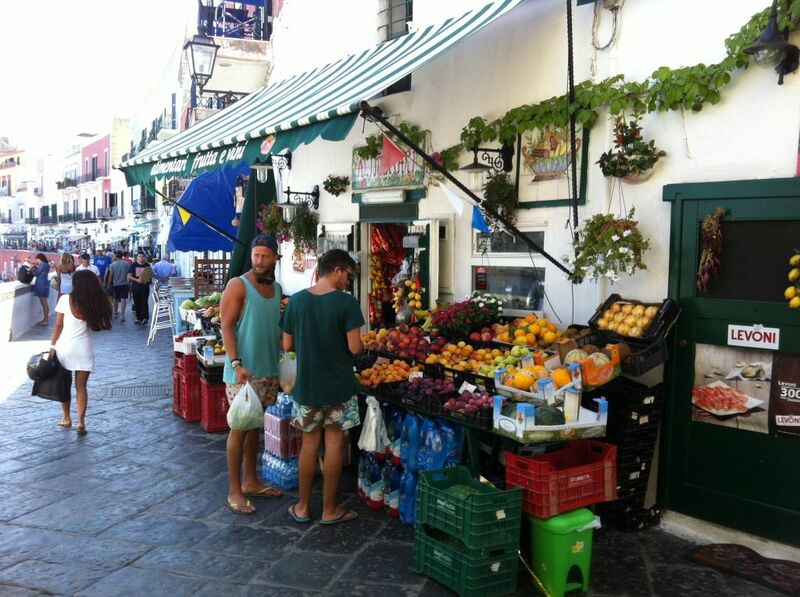 Souvenir and clothing shops are open from about 5 pm until late at night, while groceries are open during the morning and afternoon, showing their products along the street: you’ll feel inebriated by the good smell of juicy fruits and vegetables, when walking beside the stands! For a complete tour, if you want to leave with no regrets about things you haven’t seen, you may rent a scooter, a quad or a small car. 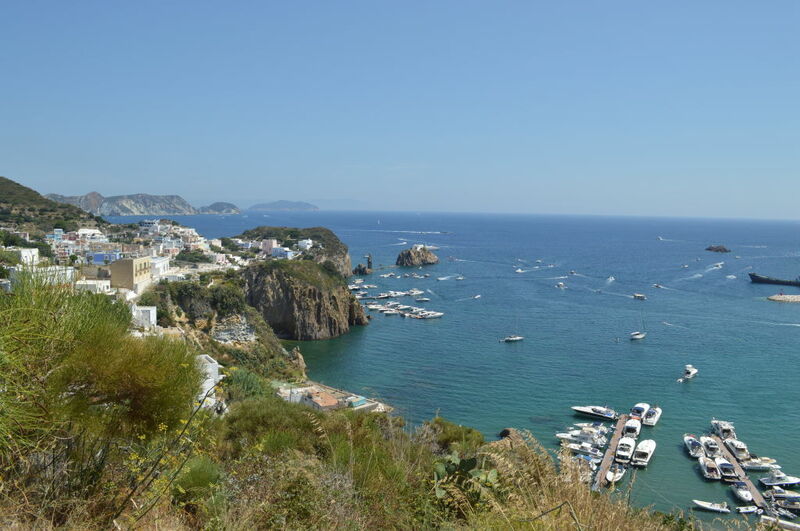 Riding along the main road, you can find some panoramic viewpoints, which will leave you breathless, with unique views from above over the harbour of Ponza and Santa Maria and also over lovely Chiaia di Luna, which can be seen only from sea or from the panoramic terrace above. 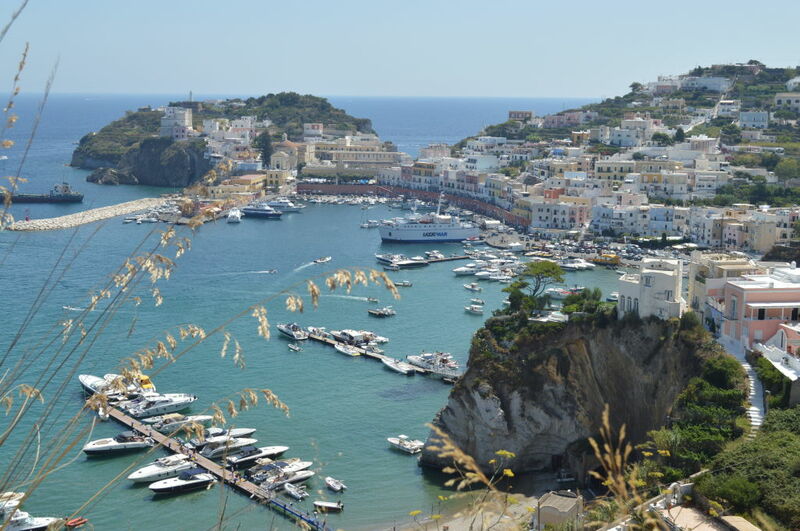 Ponza is the elite area and pride of region Lazio, still attracting every year, sea and beauty lovers, including international movie stars like Harvey Keitel and Cameron Diaz, golden ball Lionel Messi and many others. 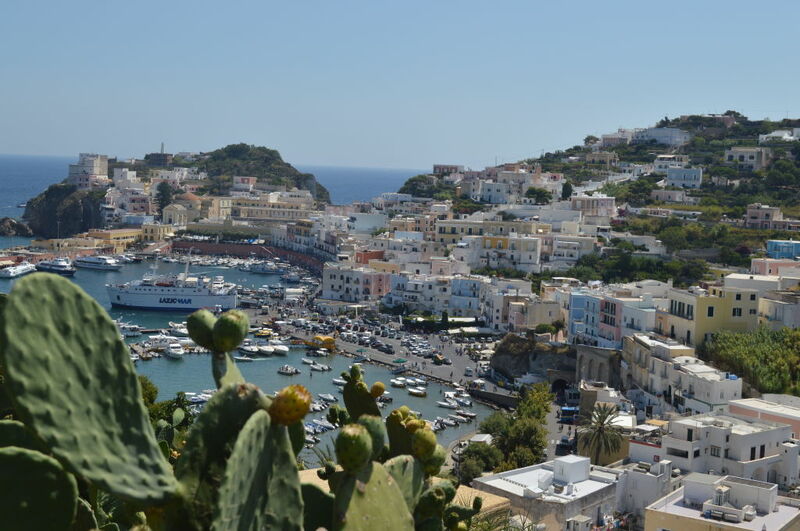 Some pratical tips for your trip to Ponza. 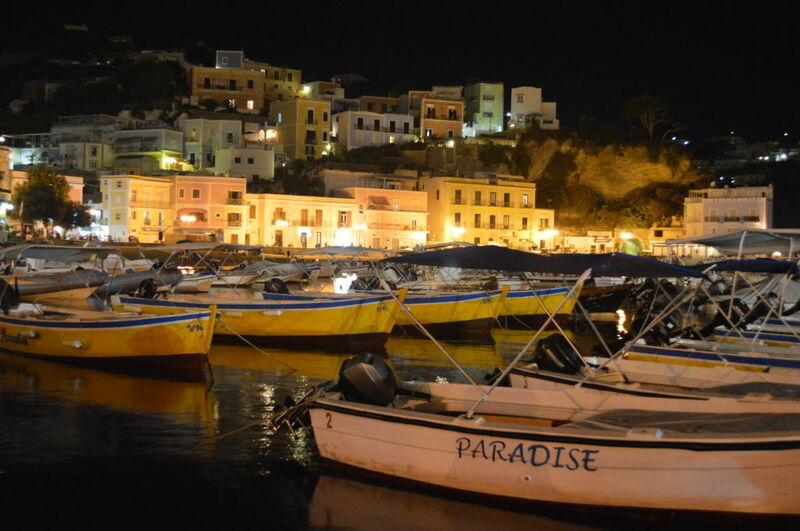 You can book your trip from Anzio, Formia or Terracina by clicking here. 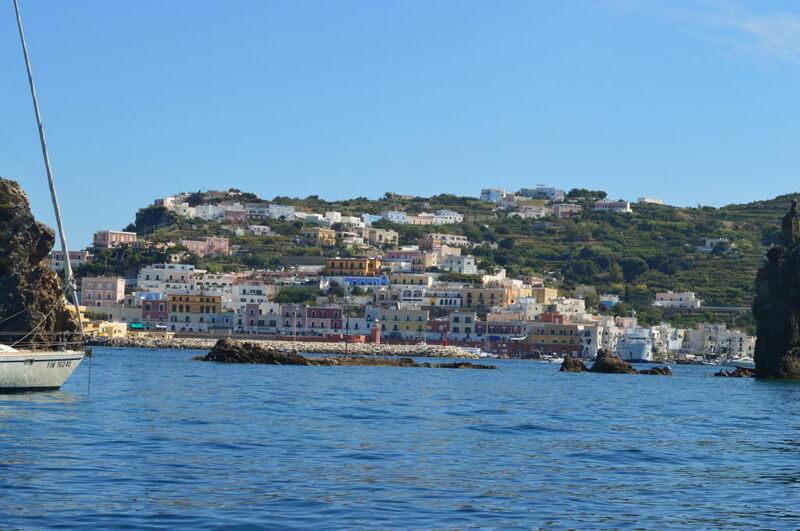 If you are landing in Rome, and you don’t need travelling by ferry, probably the most convenient port for you is Anzio and you can reach the island in just 1 hour 15 mins by fast ferry. 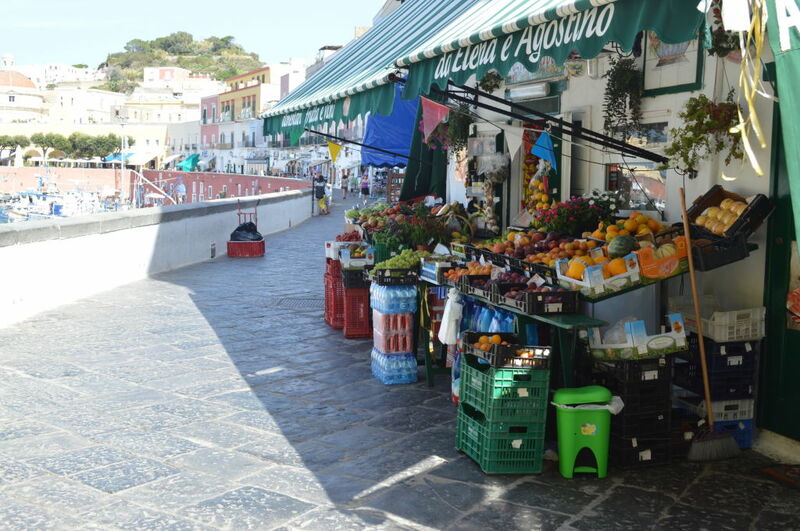 Access by car in Ponza is not always allowed. 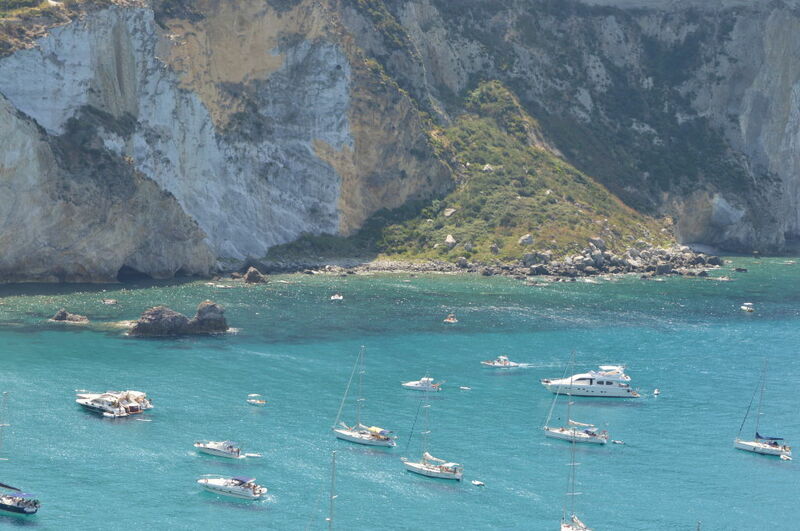 The access control is variable, so you’d better check this detail before you leave to Ponza, if you wish to go by car. 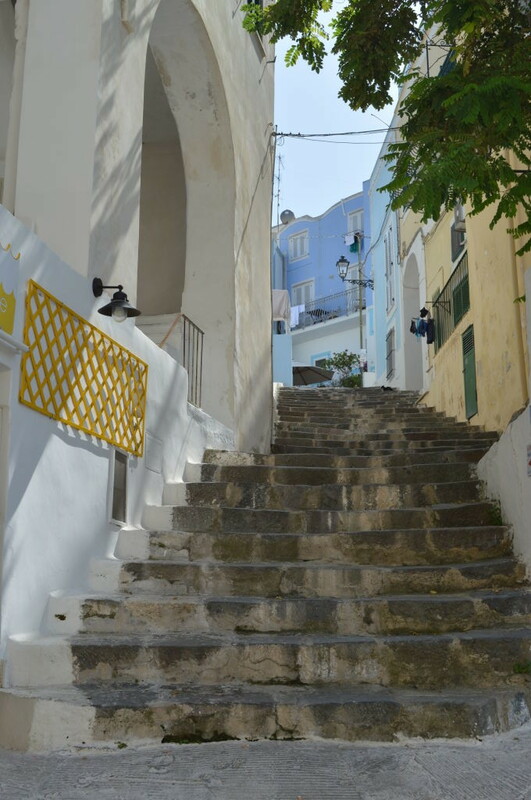 Anyway, we suggest not to bring your car with you: streets are very narrow and during summer there is quite a lot of traffic jam in the island, so you just risk to scratch your car. 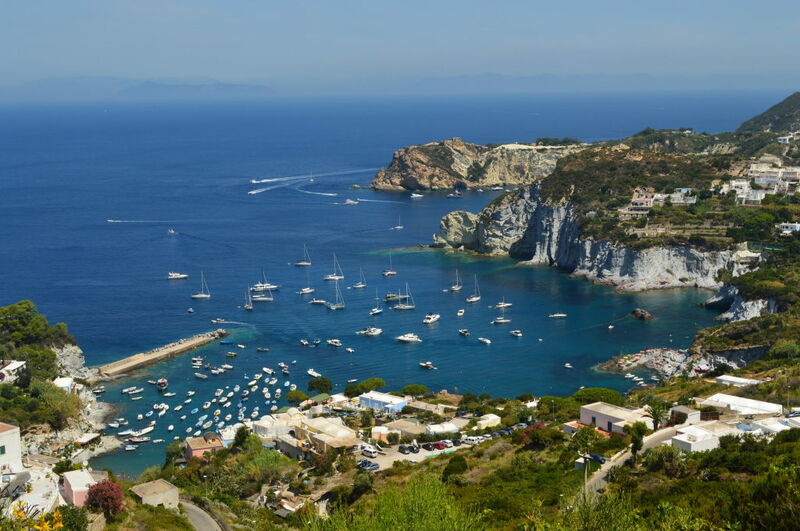 If you need a good parking service for your car before taking the ferry in Anzio, we recommend what we personally experienced: Supercar Garage – you may find more details on the official website, by clicking here. 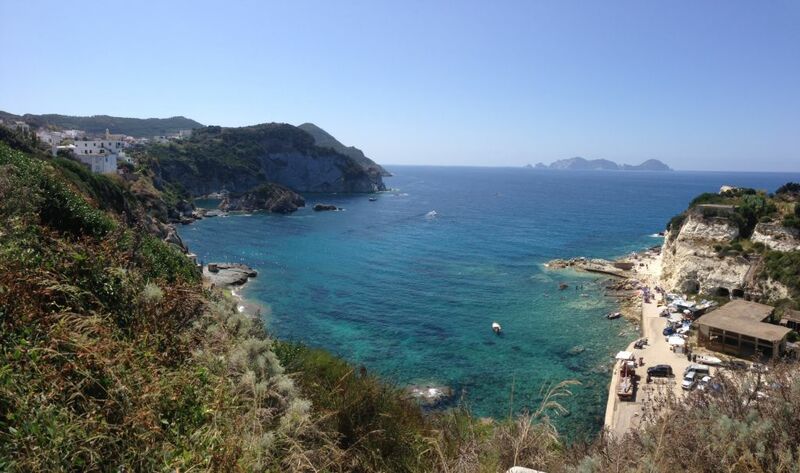 They collect your car and bring it back to you the day and time you get back from Ponza. If needed, they offer additional services like cleaning, repairing, filling up and more. 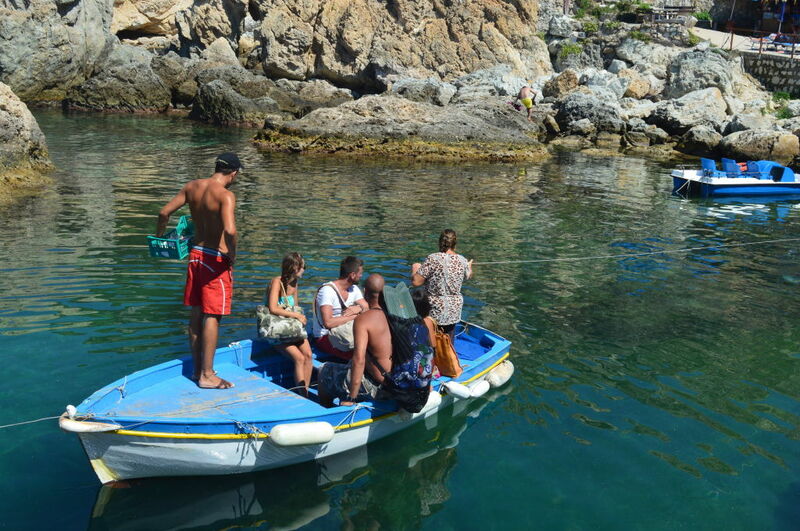 Boat: you can rent a boat and be free to choose the bays and beaches you prefer to see. Moreover driving a boat around the island is a unique experience, giving you special feelings that you won’t enjoy otherwise. 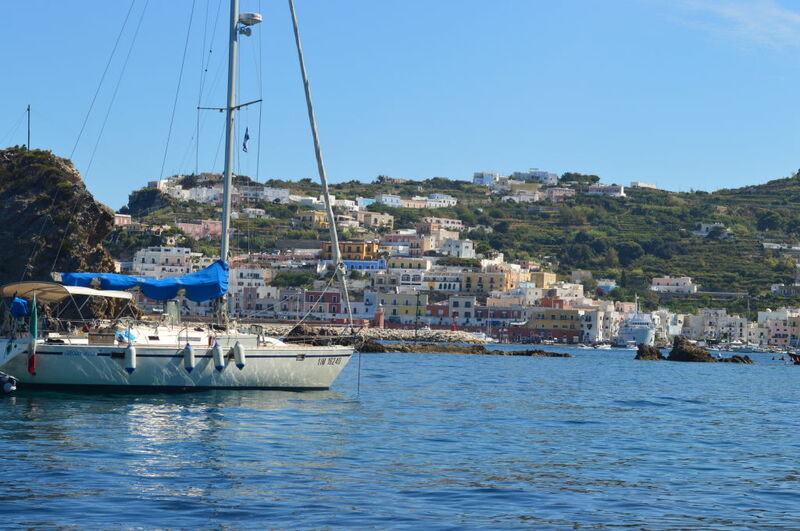 Yet, if you are not an expert at all, you’d better avoid renting a boat: Ponza is very rocky an island and you may hit a rock underwater. If this happens, it is mainly dangerous for you, but it may also be expensive, because if you break the boat or the engine, then you have to pay to repair it. “Lupo di Mare” agency is a good and comfortable solution, since they are based in Via Banchina, in other words on the quay of the harbour. They also organize boat tours. For further information about boats, tours and costs, you can visit their website here. 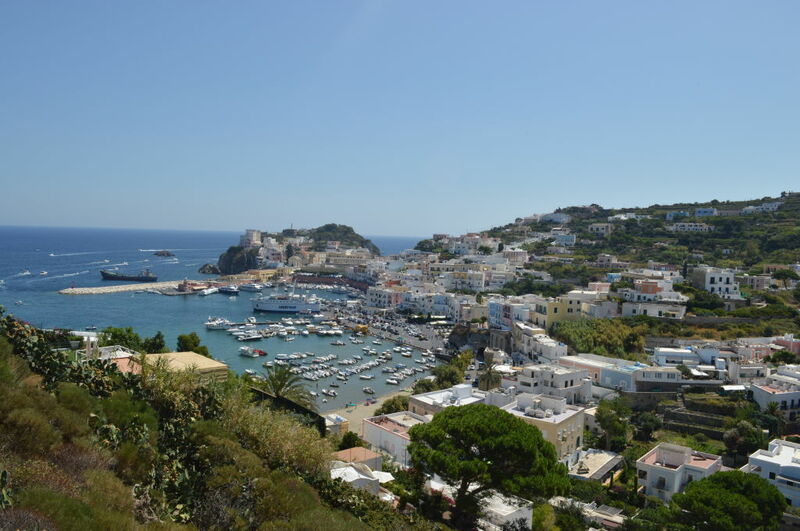 Bus: if you don’t mind to squeeze in a bus with other people, this is probably the most exciting travelling experience in Ponza! Buses run early in the morning until late at night (at least until 3 or 4am in the morning indeed). With € 1,20 you can reach any places: during the day, the bus drivers call tha names of the beaches, so that you know where you have to get off; at night, they also stop by the main restaurants on the island and they call their names as well. Once you want to go back, you just have to stand in the same place where you got off (opposite side of the road) and after 10 minutes max. the first bus will drive you back. This option is nice also because you have the chance to enjoy a kind of island tour, since with one ticket you can go anywhere. 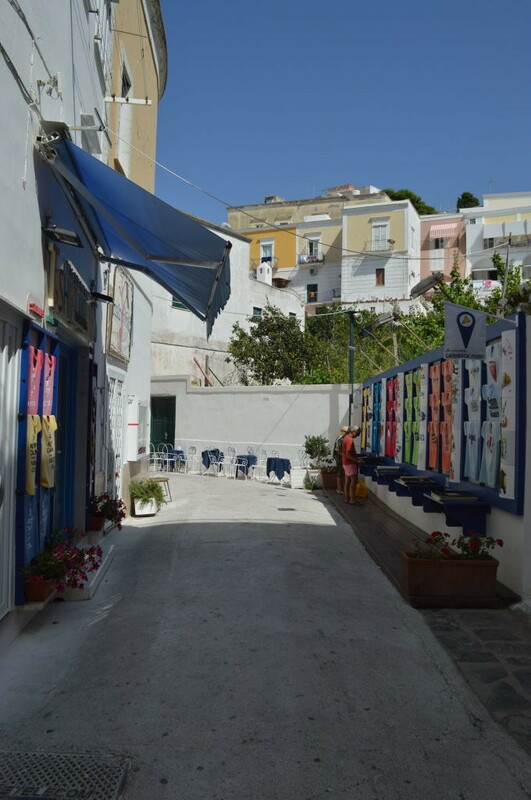 Just an advice: streets in Ponza are quite narrow and buses have normal sizes, so don’t get scared when they pass very close to other buses or to the street edge: they know what they’re doing! At the same time, don’t get nervous if 2 buses meet up in the same narrow place and one of them has to reverse to give space to the other one. It’s all part of the game! Taxi: it is a good option, if you don’t feel like driving or going by bus. 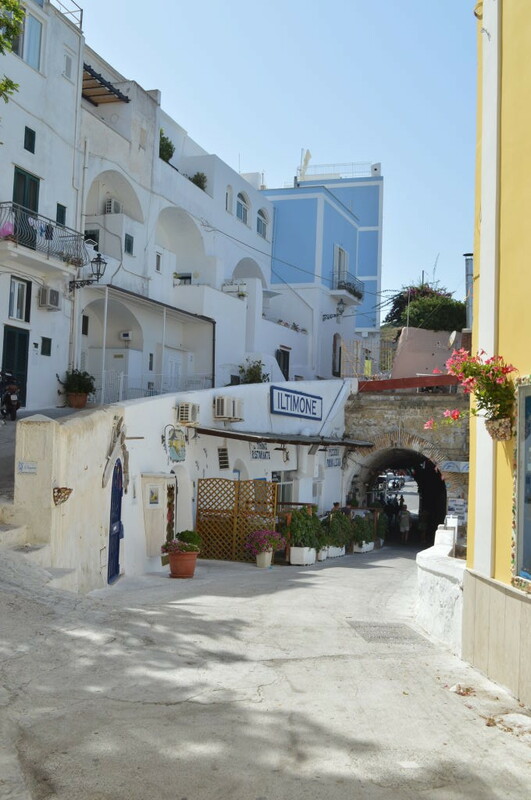 In Ponza taxis are very small, because the streets are narrow. So consider that if yours is a group of people, you may need more than one taxi. Here you can find a list of numbers you may call to reserve a cab once you are there: click here. 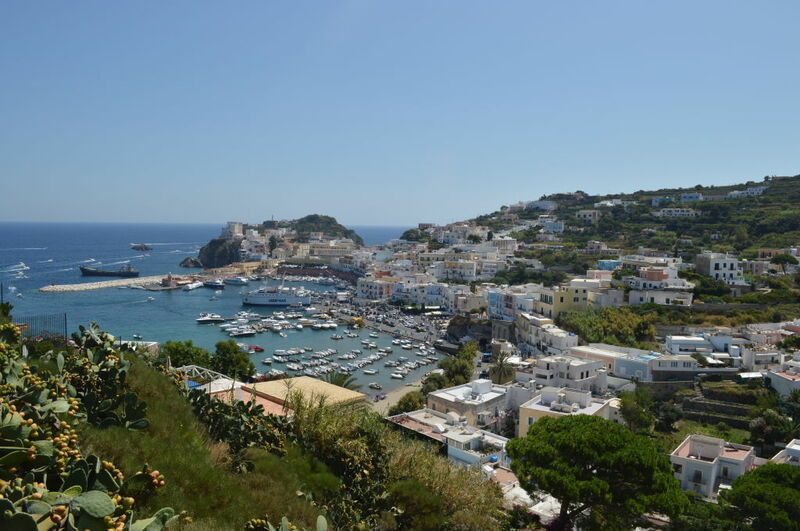 If you wish to see both Ponza and Palmarola, we recommend to go for separate tours, rather than the combined one (Ponza + Isle of Palmarola), or you’ll see very little of Ponza, while it deserves a lot. 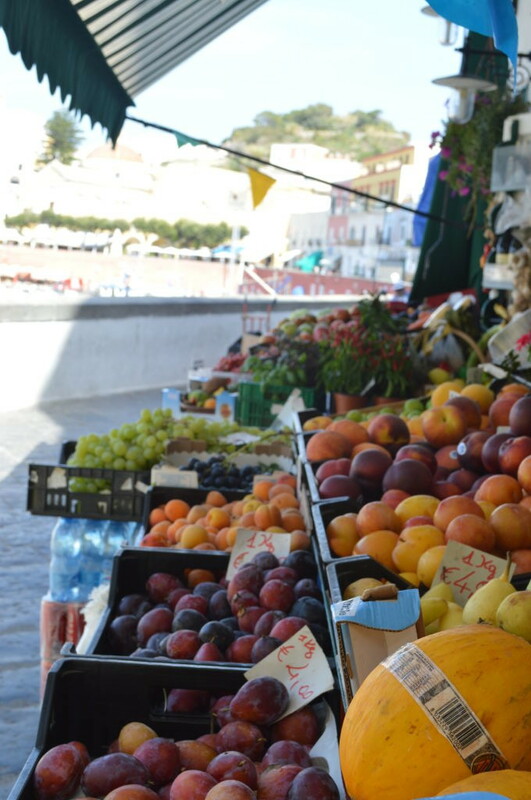 For details, timetables and prices, you can visit the official website of “Cooperativa Barcaioli Ponzesi” by clicking here. If you have difficulties with the language, contact us. 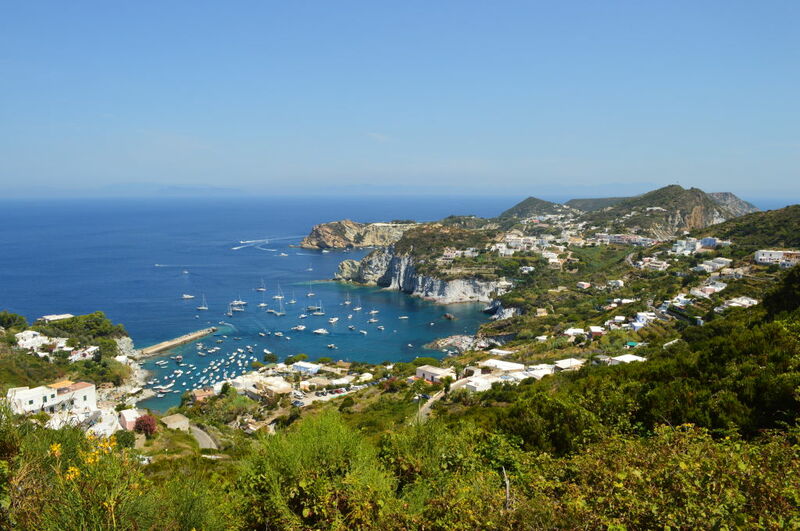 Scuba diving: thanks to its chrystalline sea and lively sea bottoms, Ponza is a perfect place for scuba diving and there are about 20 spots for this practice. 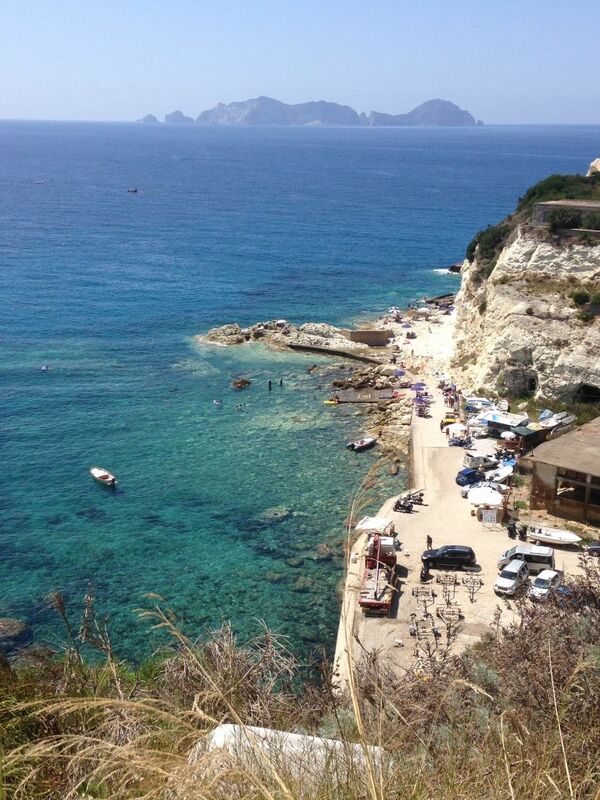 Amongst the best known, Scoglio Rosso, Punta della Madonna, Le Formiche. 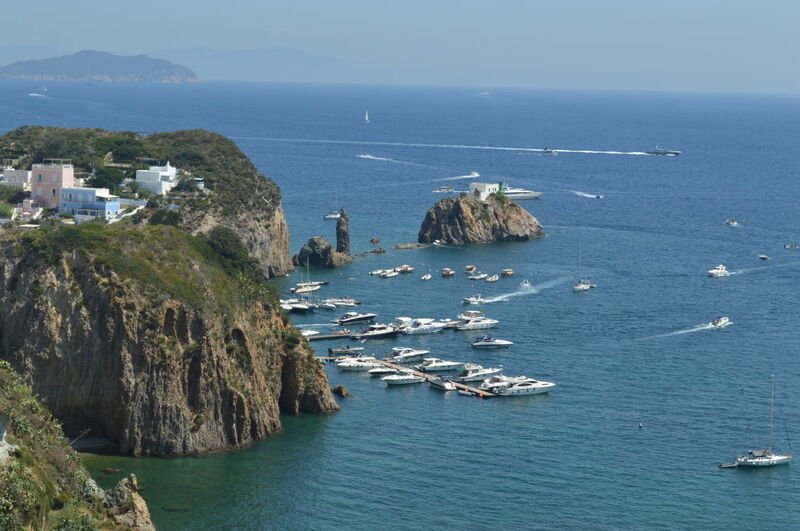 In Ponza there is a very valued diving center; for further information, you can visit the official website here. 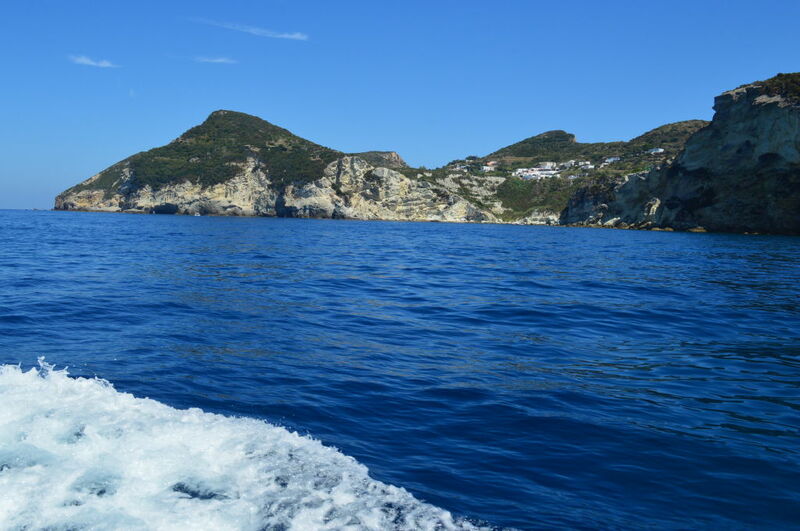 Our tip: whether you decide to visit the island by bus, scooter or else, we recommend you to go for a boat tour first, so that you can get a global idea of how Ponza is shaped. 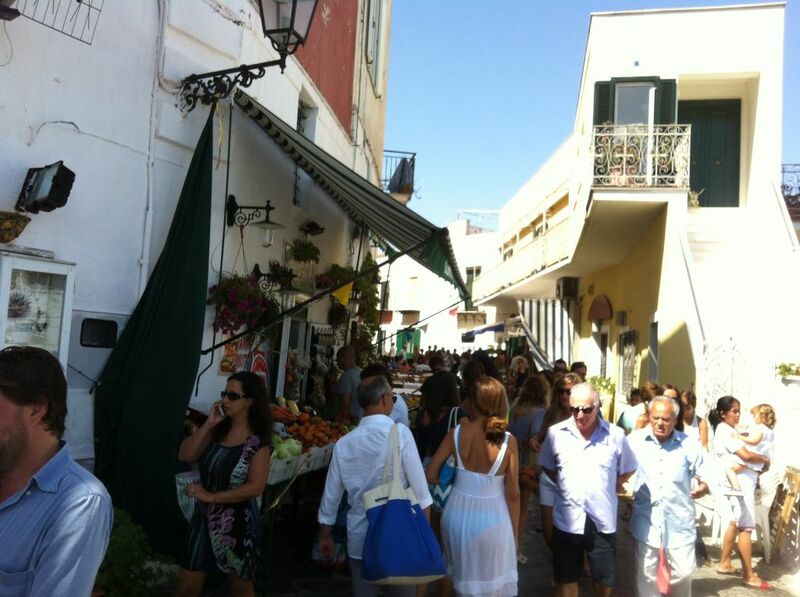 This way, after visiting all the bays, you can clearly decide what else is interesting for you to be seen on the island. Concerning the accomodation, especially for young people, we suggest to book a room or rent a flat in the harbour area: this way you’ll be close to all services, restaurants, shops and in the middle of the movida; during the day you’d move anyways to visit the bays and the island in general.